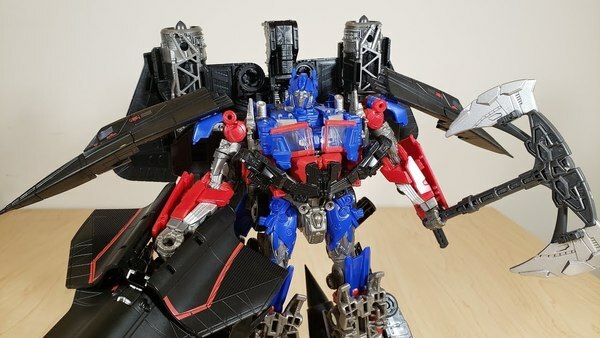 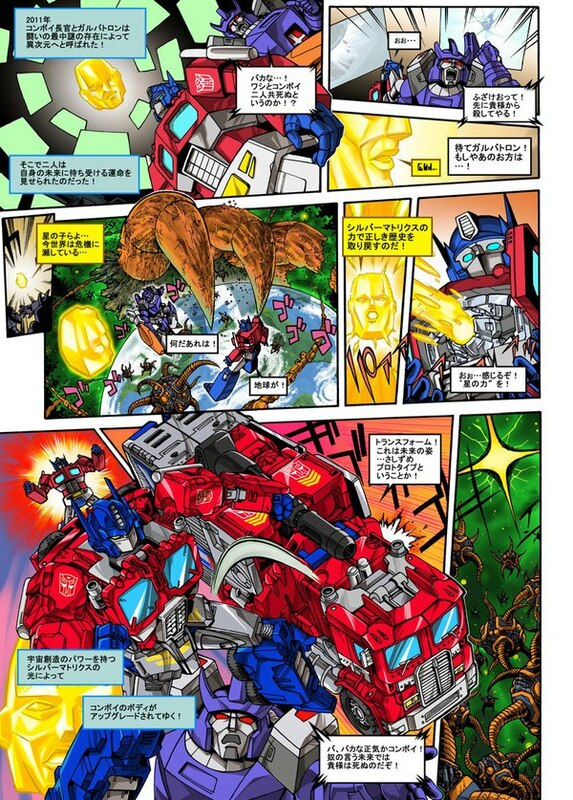 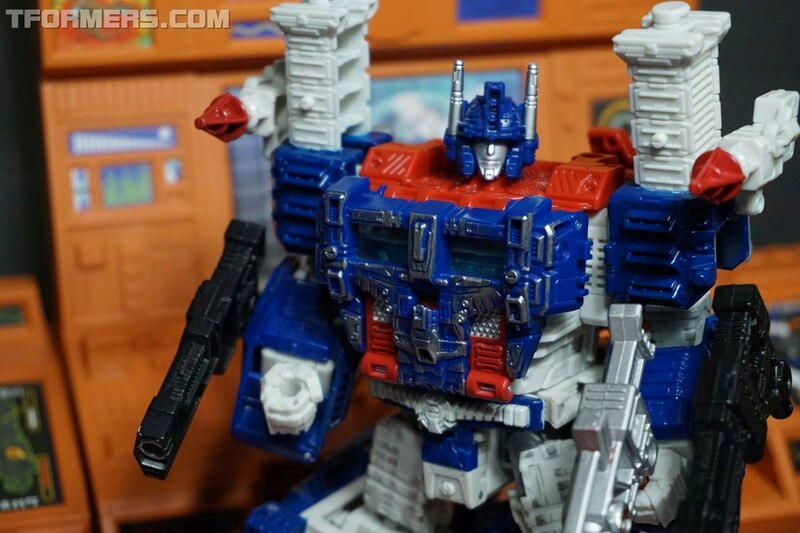 What initially looked like an upgraded Voyager Optimus Prime, turns out to be much more than just a bunch of add-ons. 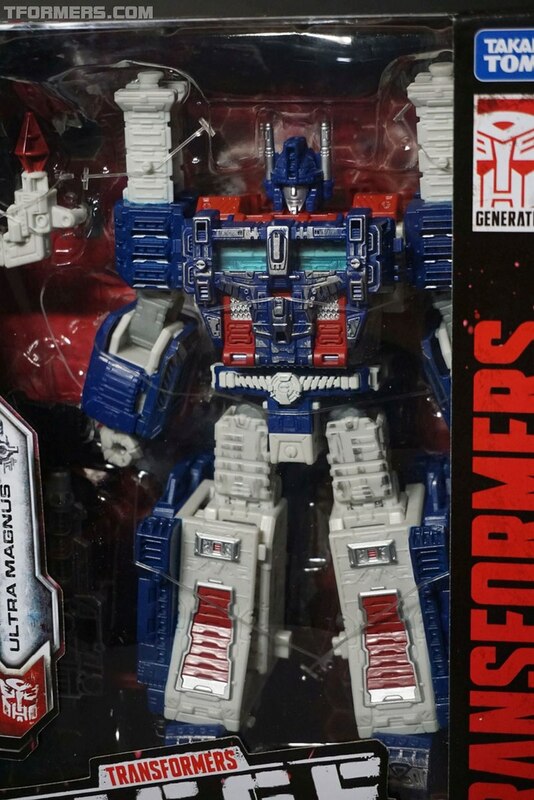 Its a rare occasion when Ultra Magnus gets his very own outfit. 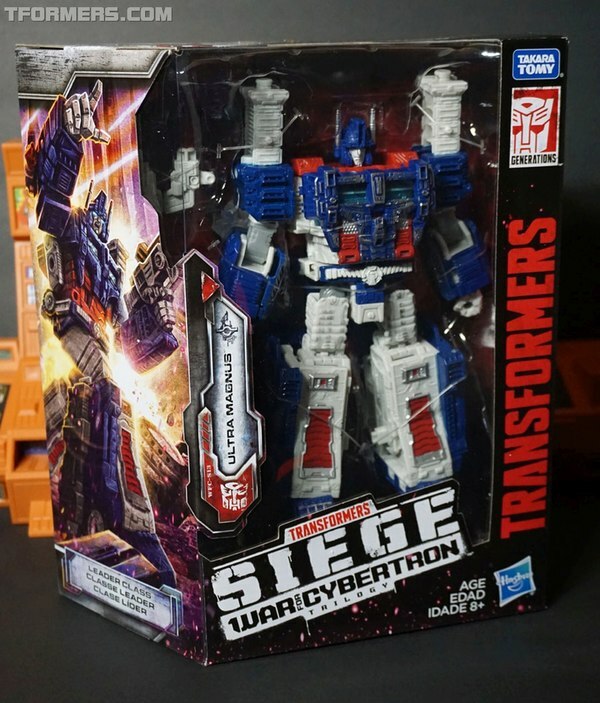 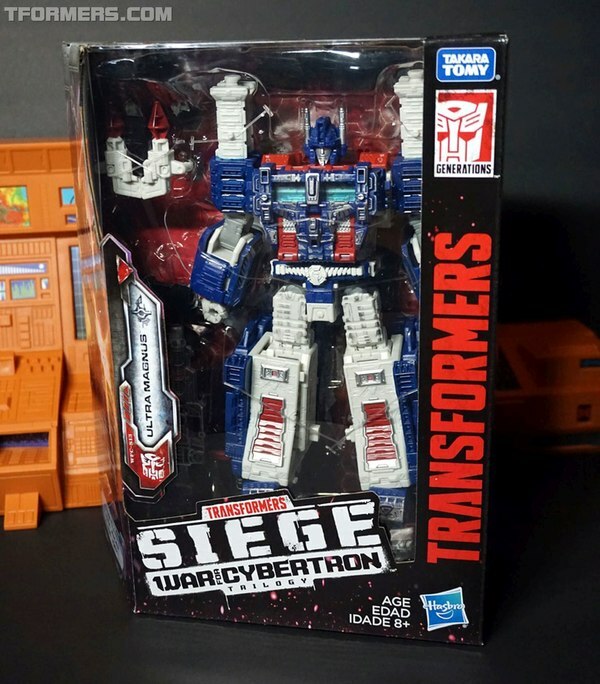 This time, he's really stepping out for the War For Cybertron: SIEGE party. 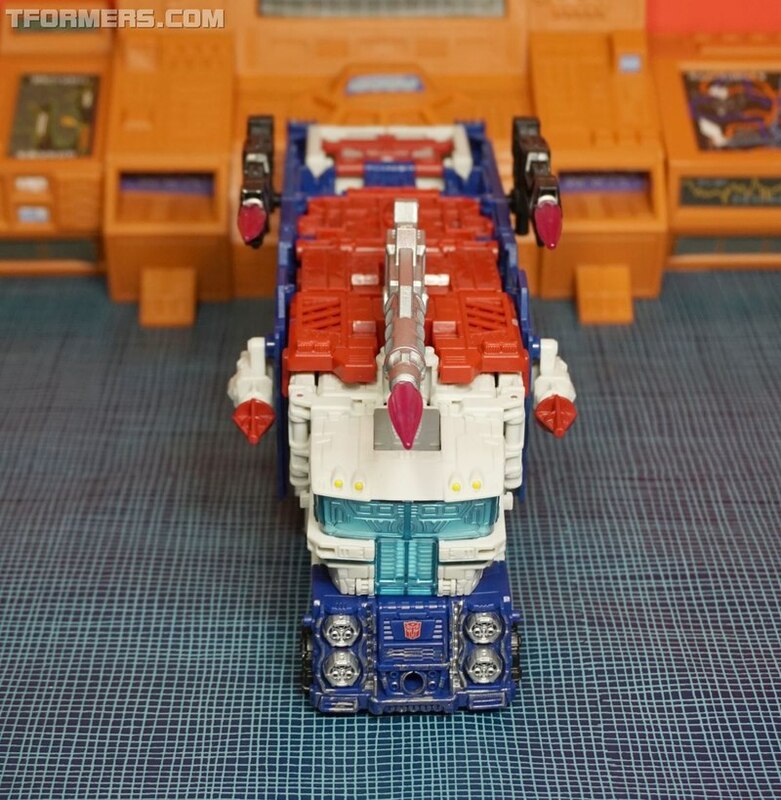 Decked out with G1 goodness handed down from his Diaclone ancestor, the Powered Convoy. 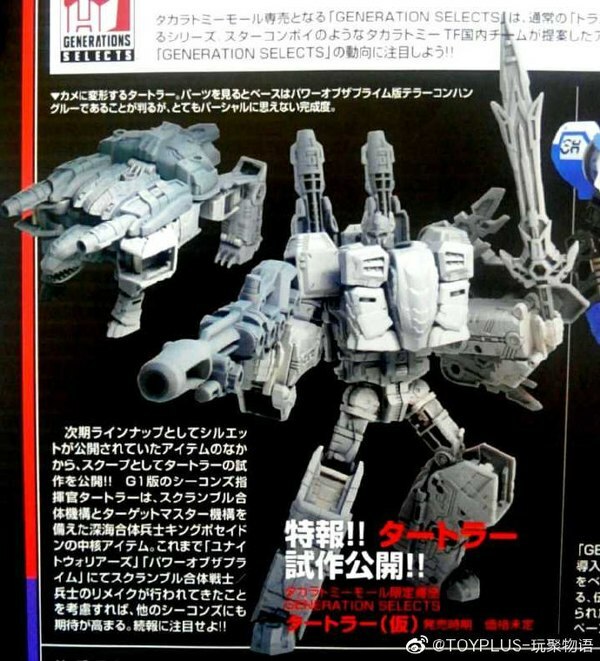 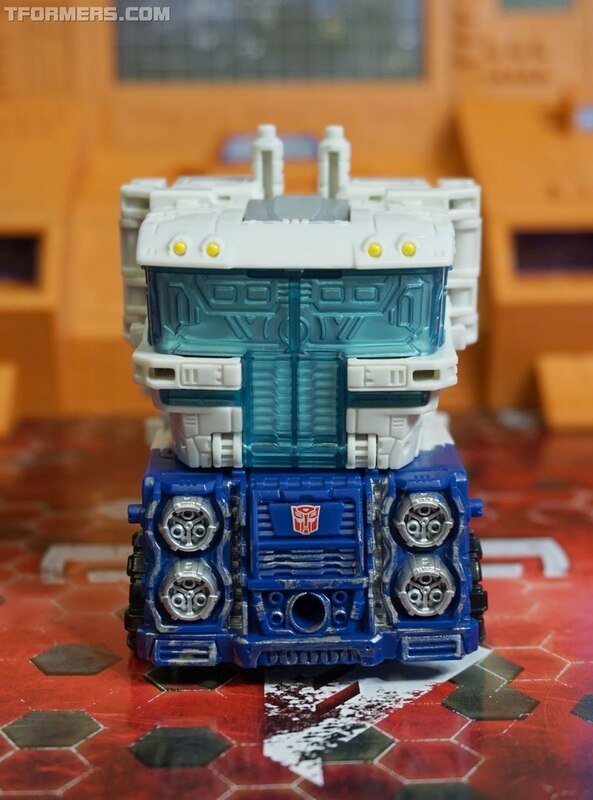 While Siege Ultra Magnus' Powered mode captures the classic Japanese mecha-look of the original design. 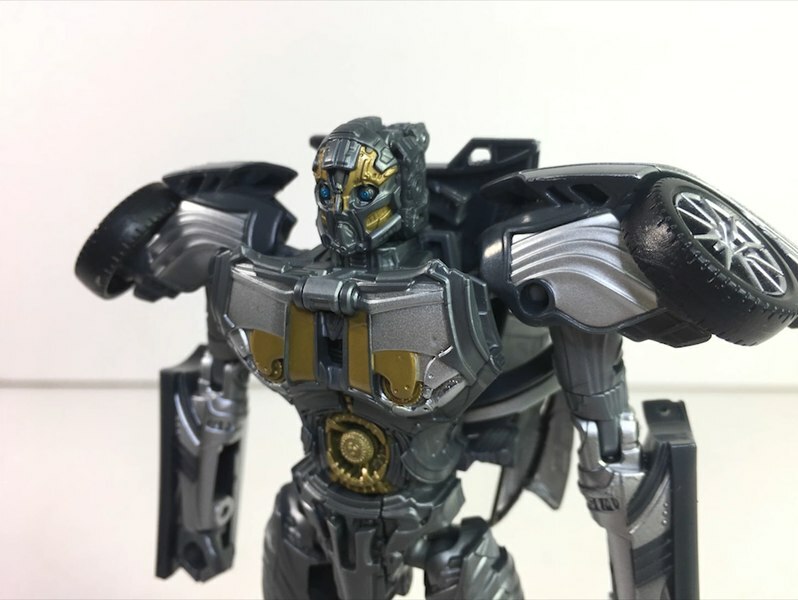 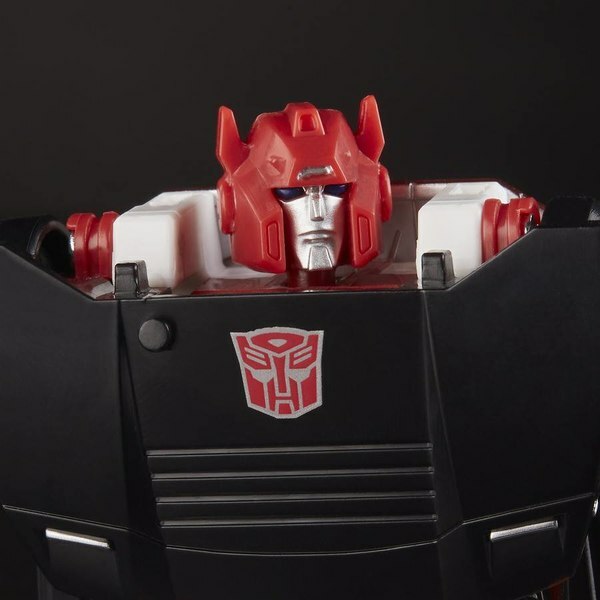 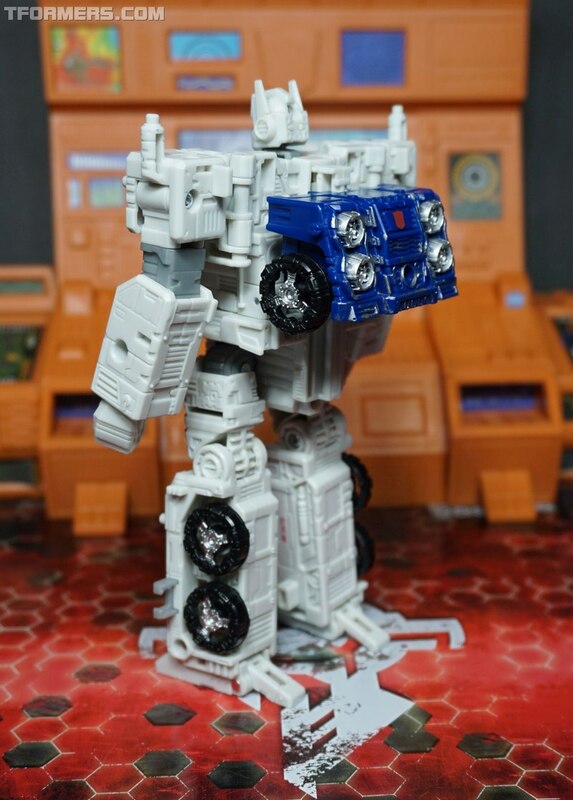 Surprisingly, his alternate modes trade the Diaclone / Generation look for an off-world Cybertronian look inspired by the 2001 cartoon series, Car Robots (Japan) / Robots In Disguise (USA). 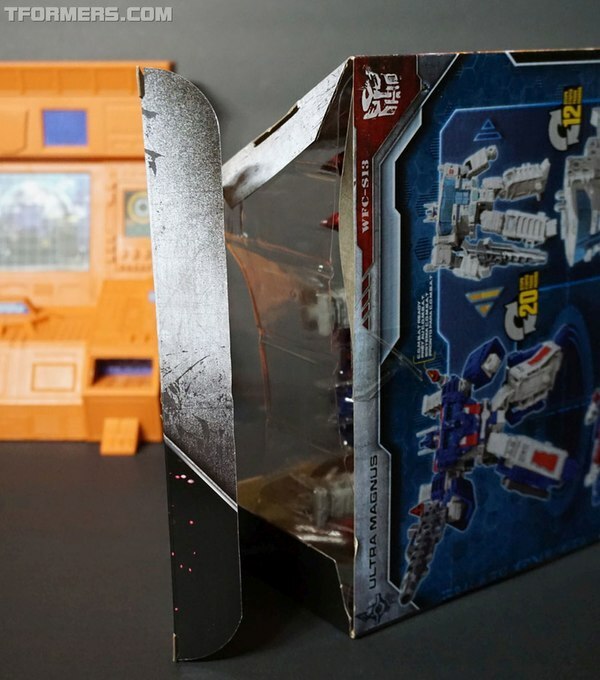 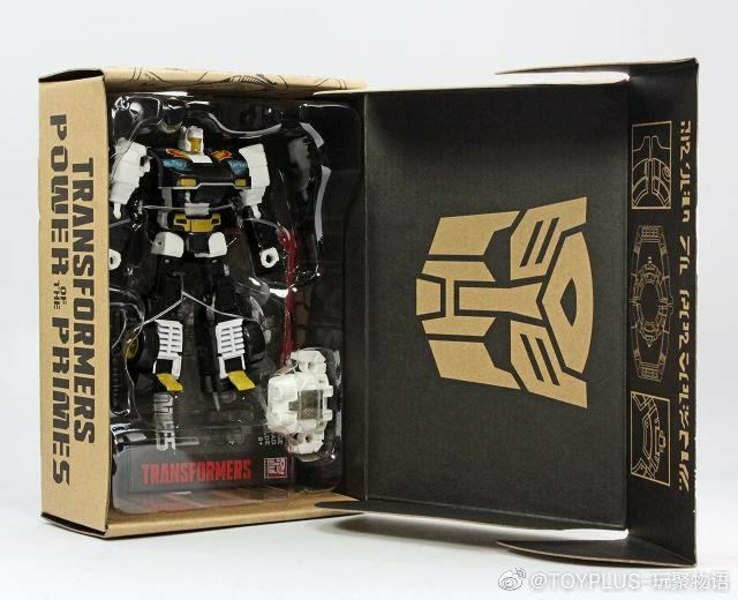 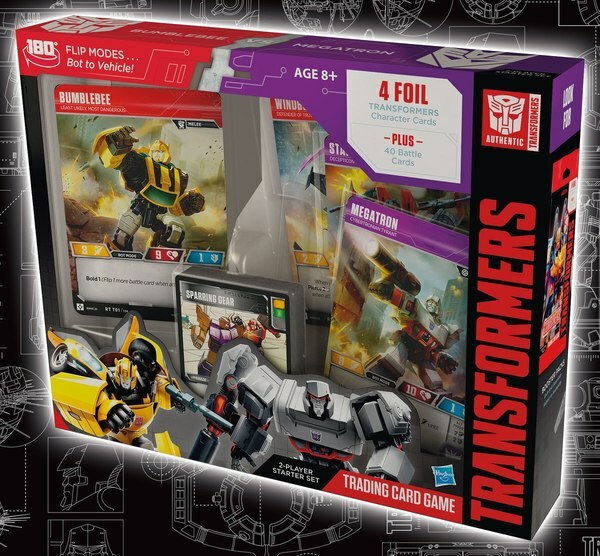 The Leader boxes are a bigger and made of a sturdier corrugated type cardboard that is adorned with Cybertronian designs. The figure and weapons mounted on the standard clear tray with plastic tie-downs makes getting the figure out of the box quick and easy. 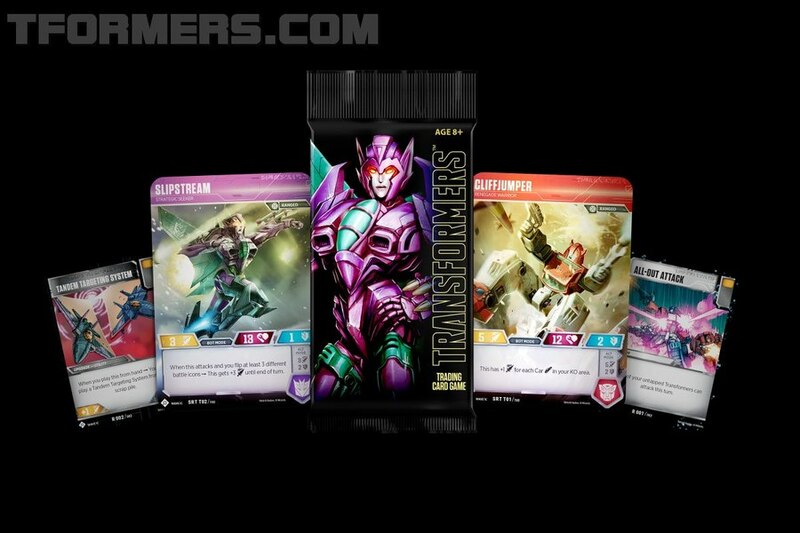 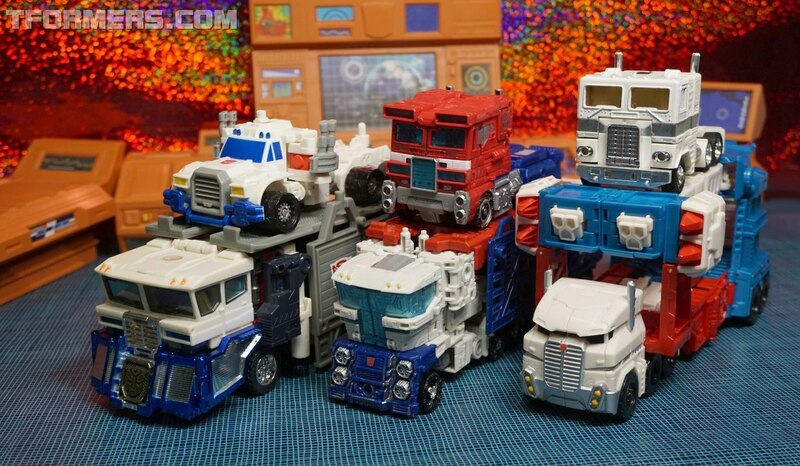 The first indication the toy is smaller than other Leaders is more tray surrounding the toys than the Voyager and Deluxe figures. 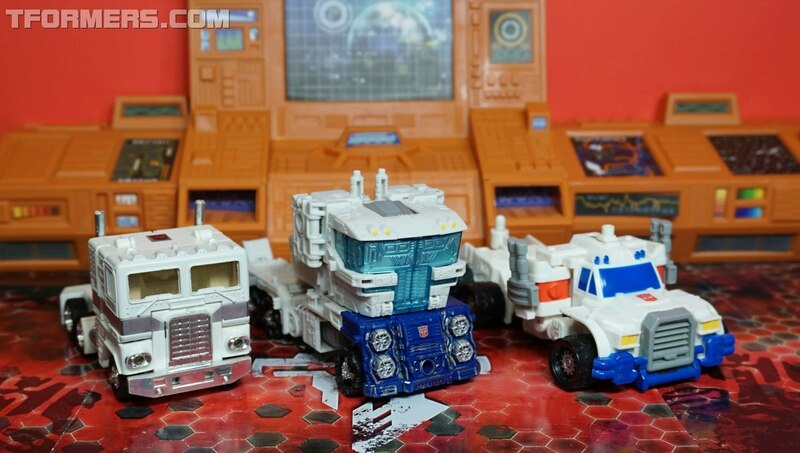 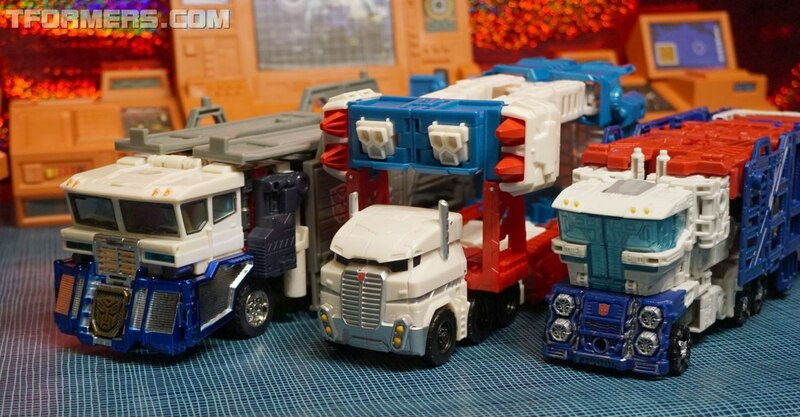 Out of the box, Ultra Magnus has the same sturdy build quality as the Voyager and Deluxe toys. 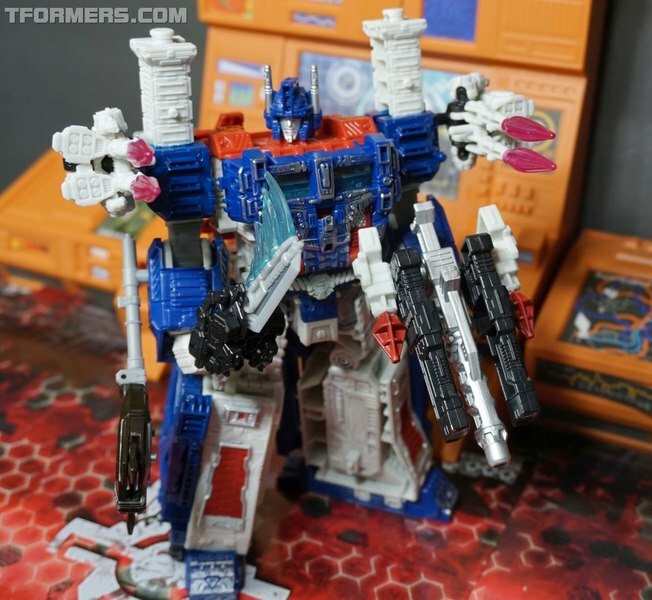 Feels softer, but tougher build than the recent Combiner Wars and Power of the Primes, without the height. 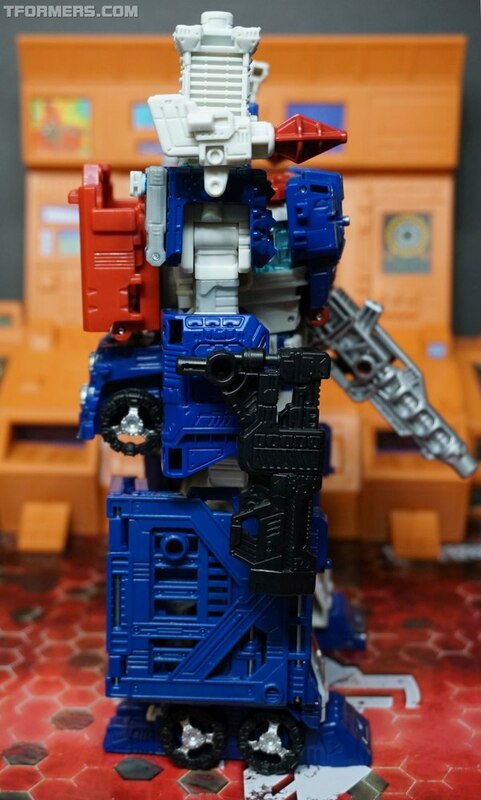 After a few minutes of handling the figure, the size doesn't feel like much of an issue to me when they have reproduced him so well. 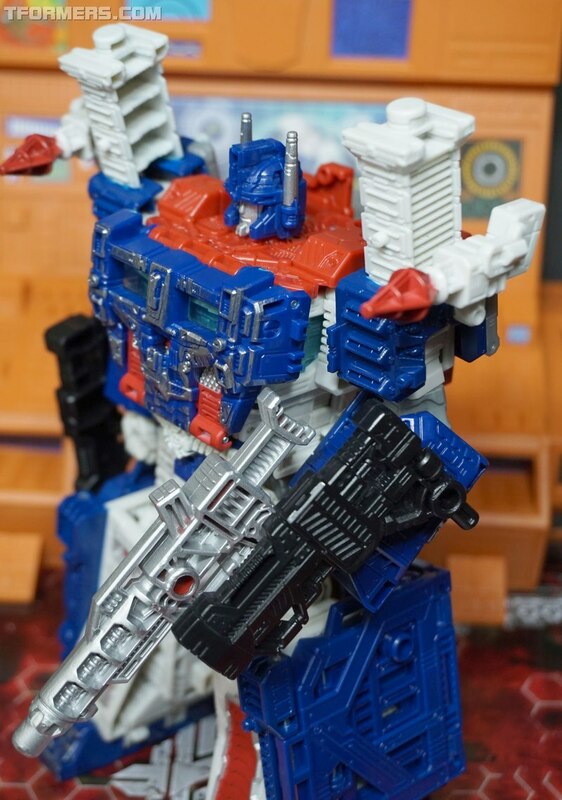 Complete with his signature shoulder stacks, chest plate, Popeye forearms and huge mech-legs. 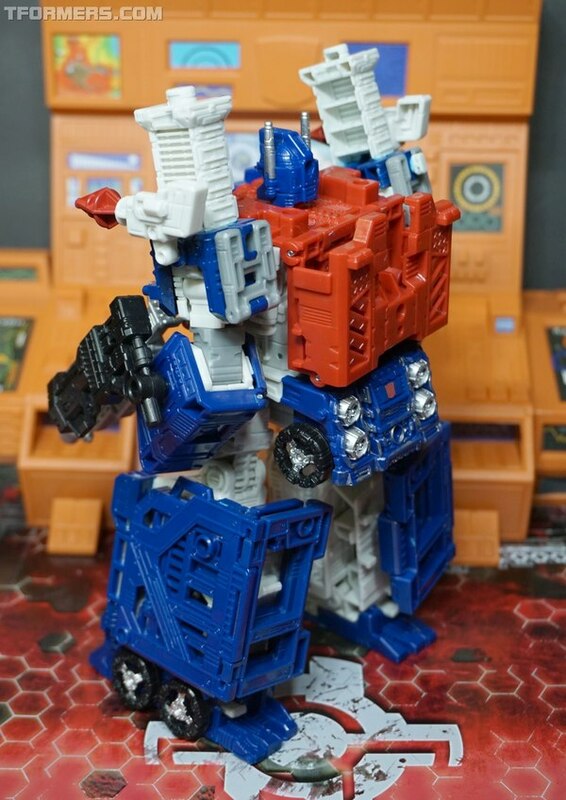 What stands out from the original is he is really well articulated in Powered up form. 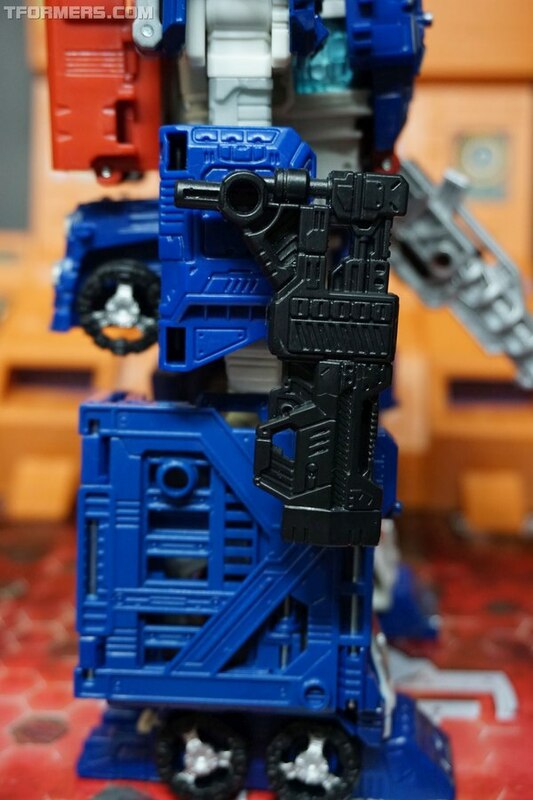 The sturdiness and excellent mobility in this figure really grows with the addition of all those 35 mm ports to accommodate other Siege figures. 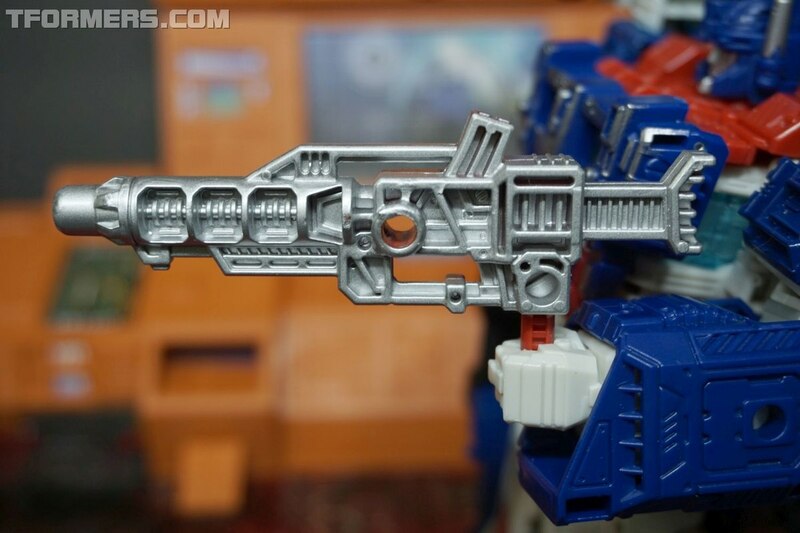 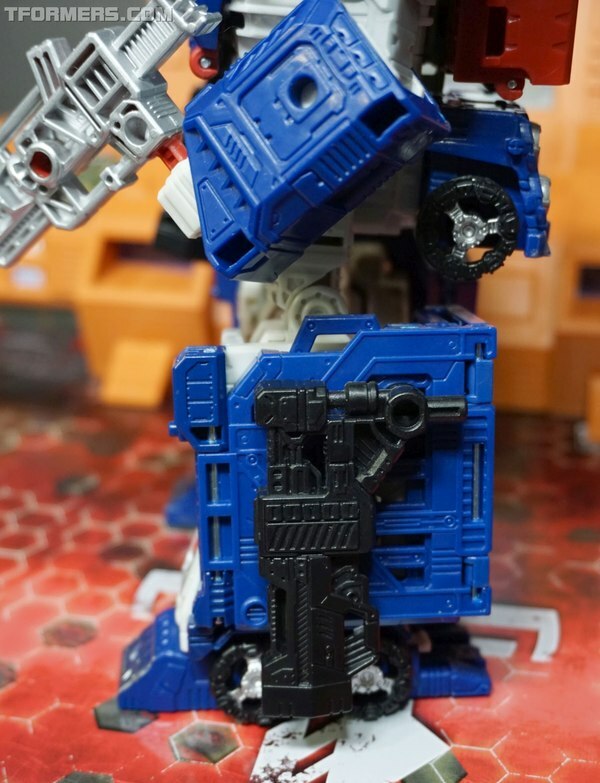 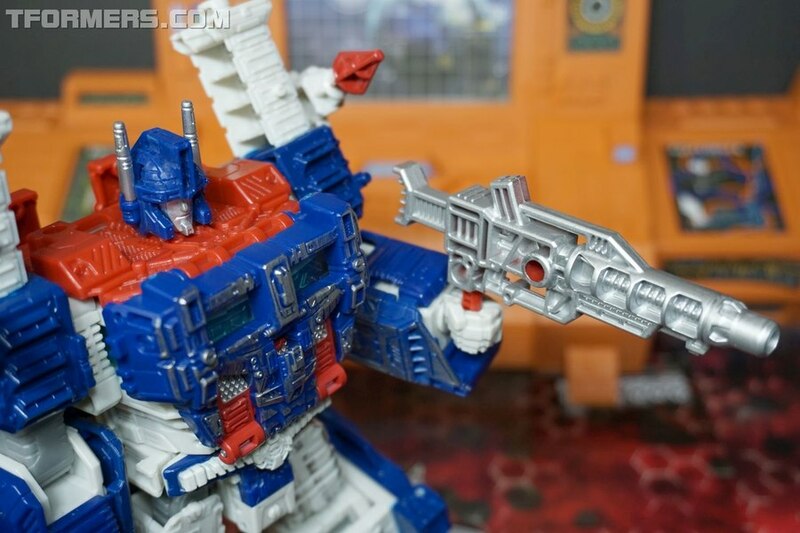 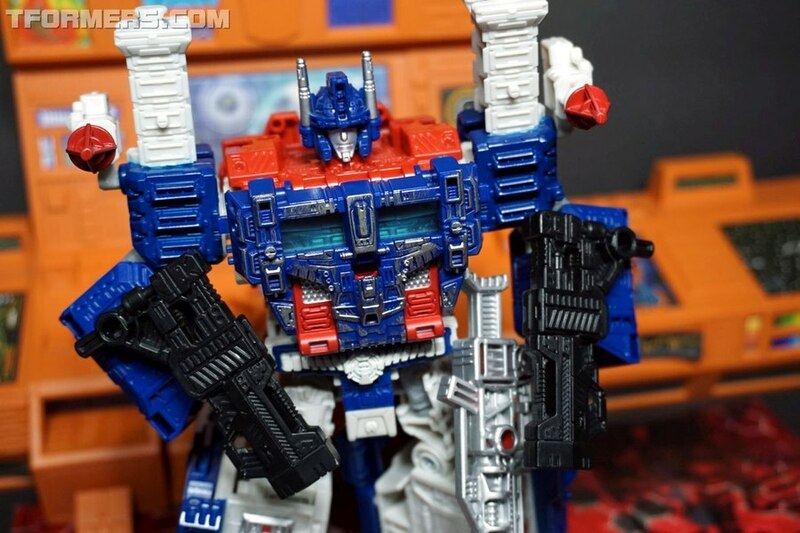 Speaking of ports, Ultra Magnus includes a set of three guns designed to plug and play in various ways. 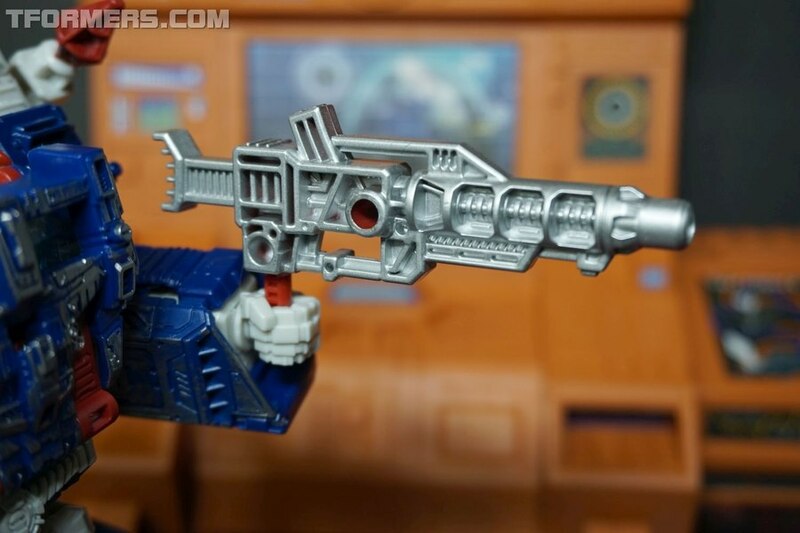 The larger silver gun, with a cool new design that expands on the original, has 35 mm ports on the sides to allow combination with the two black guns with left and right positioned pegs for merging with larger gun, or placement on the legs, or any of the many posts on the robot, truck and trailer modes. 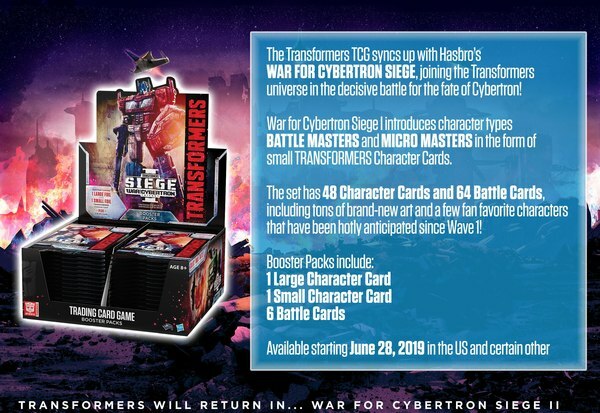 Additionally, the weapon barrels are sized to accommodate some of the the blast extensions that come with the Battle Master packs. 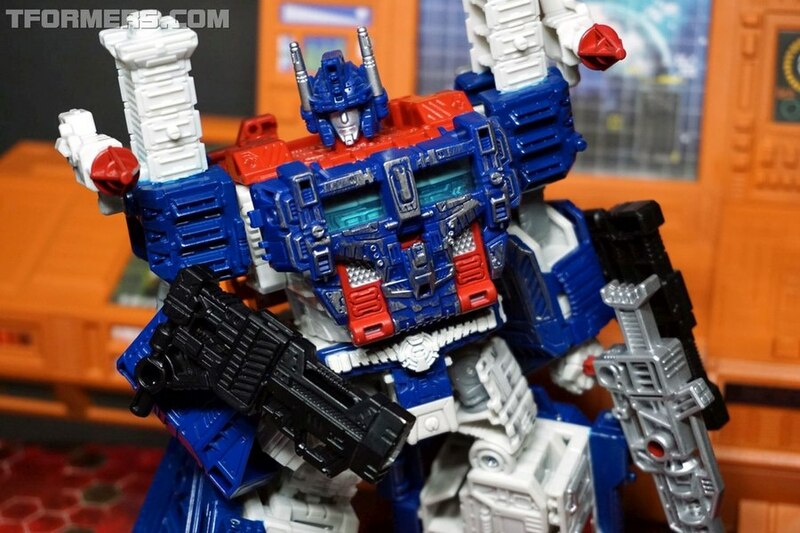 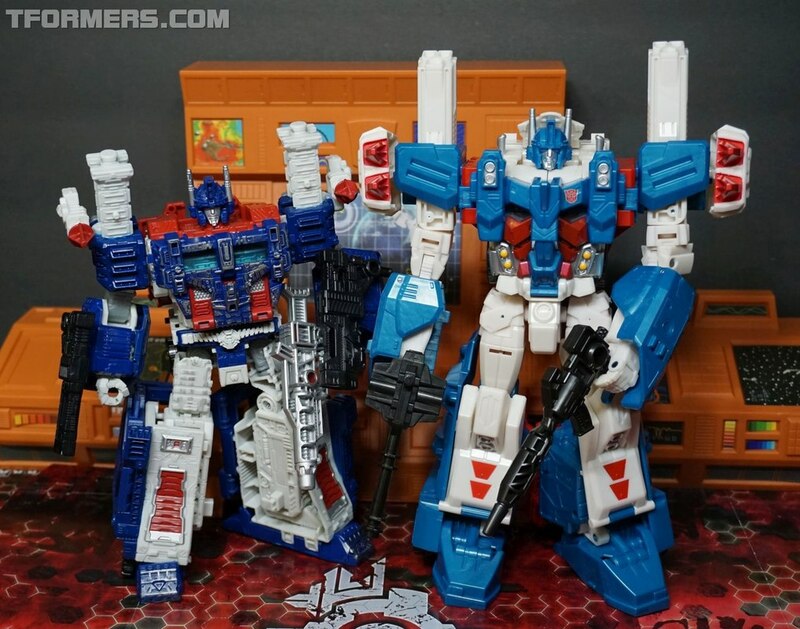 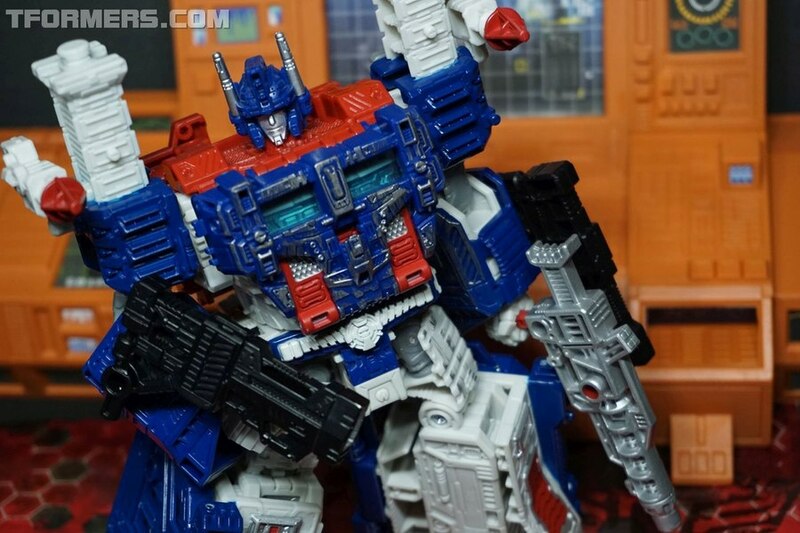 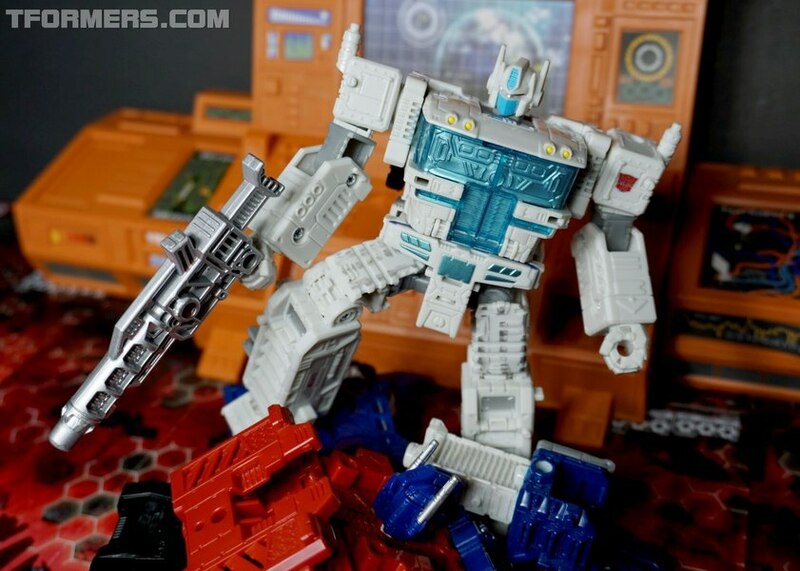 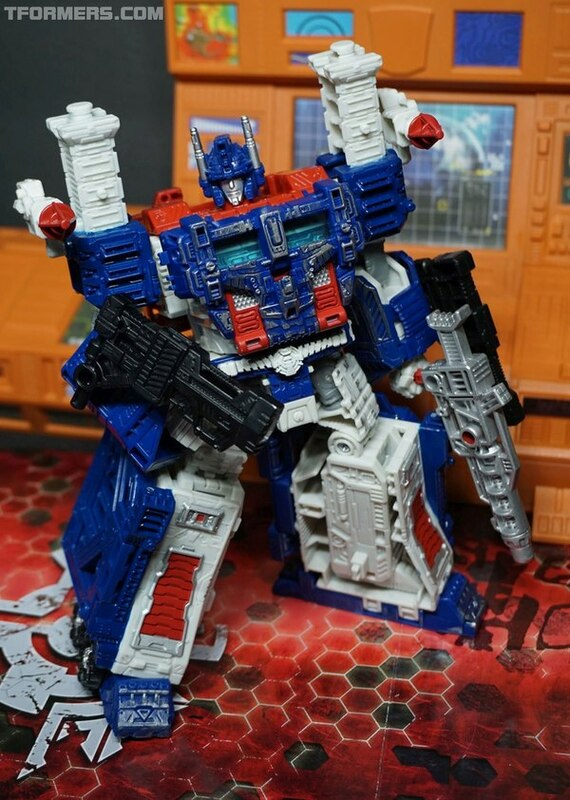 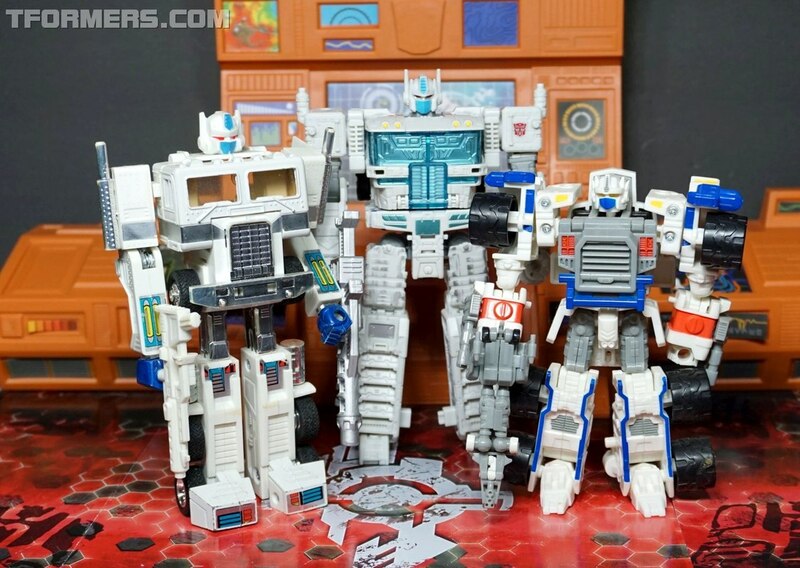 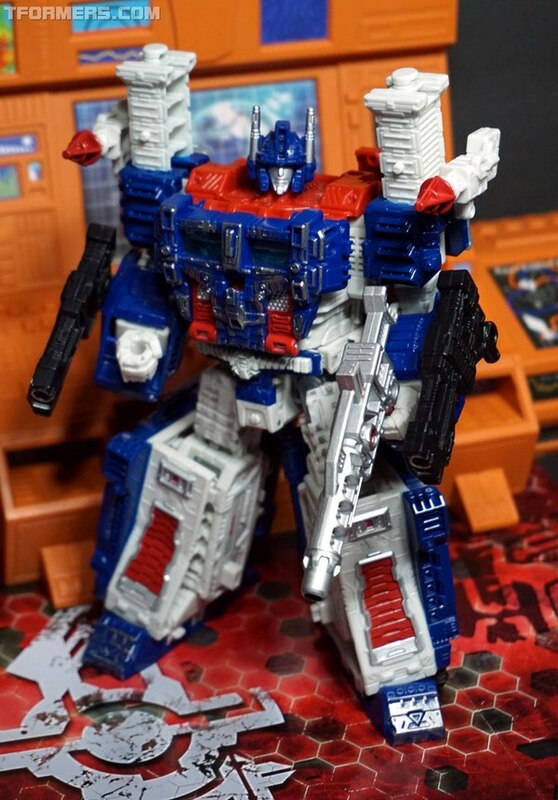 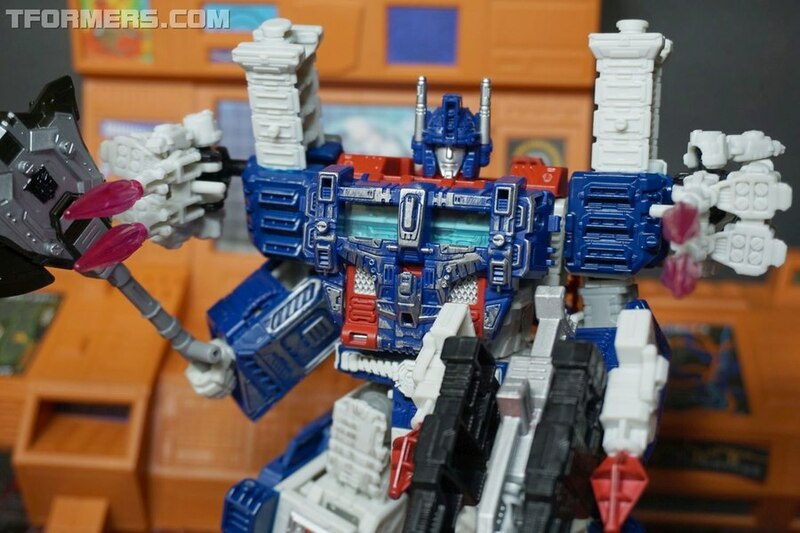 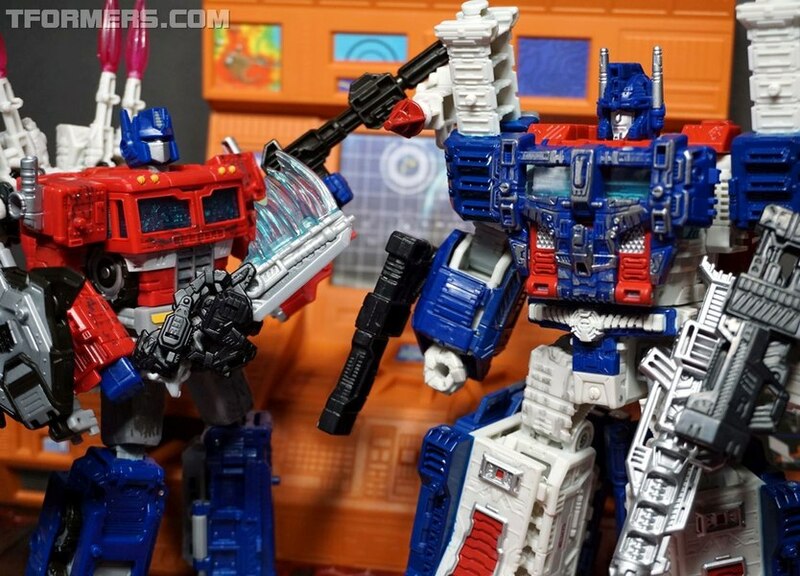 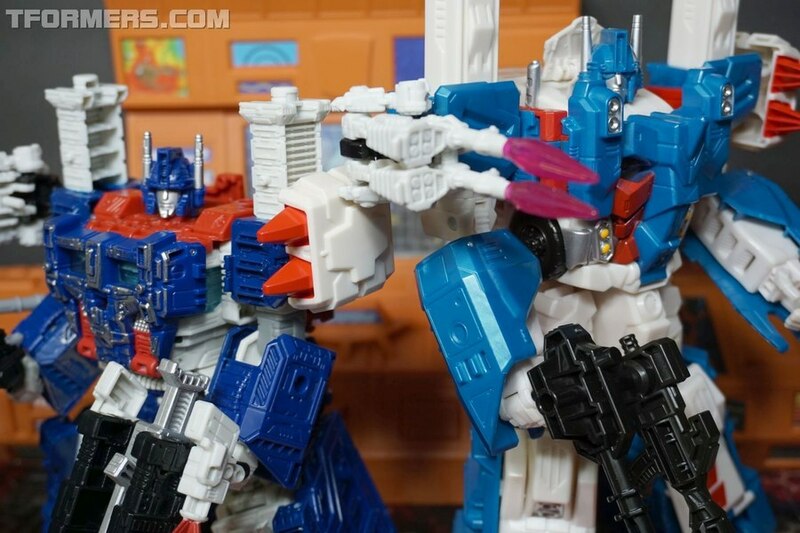 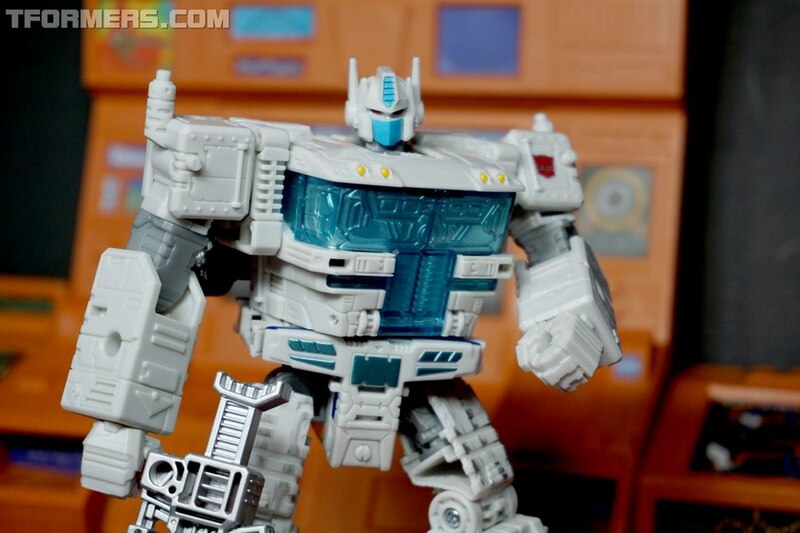 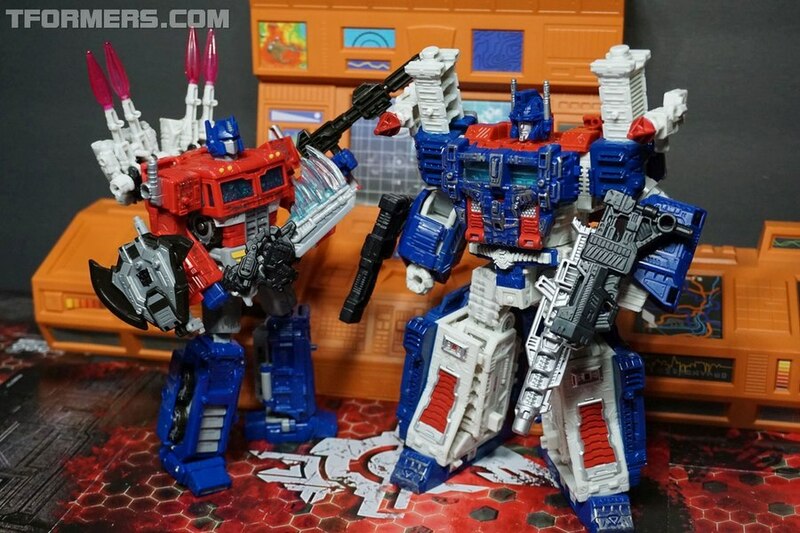 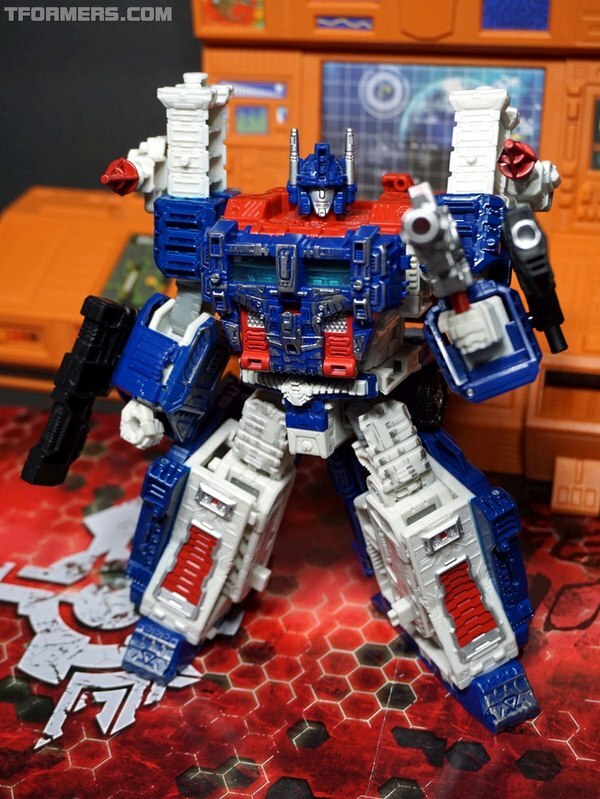 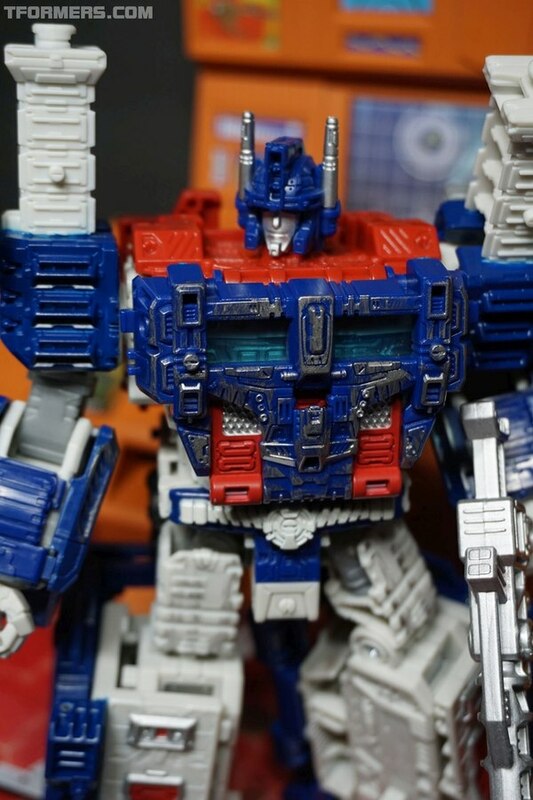 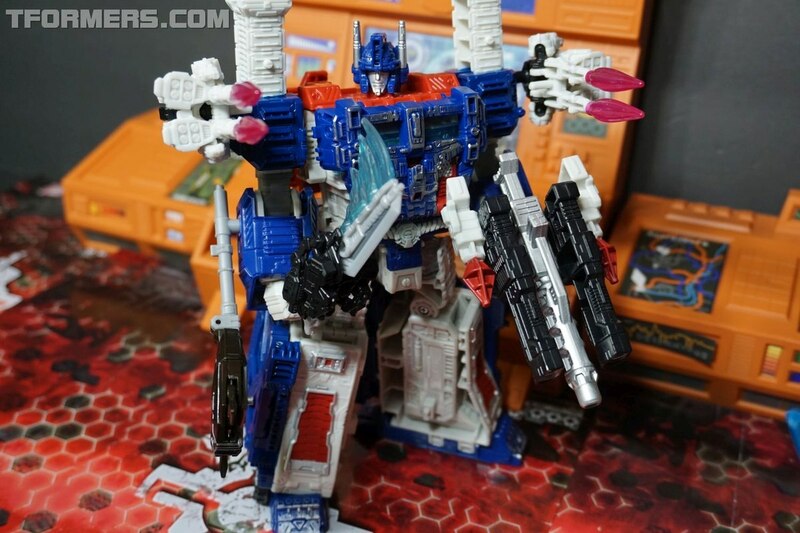 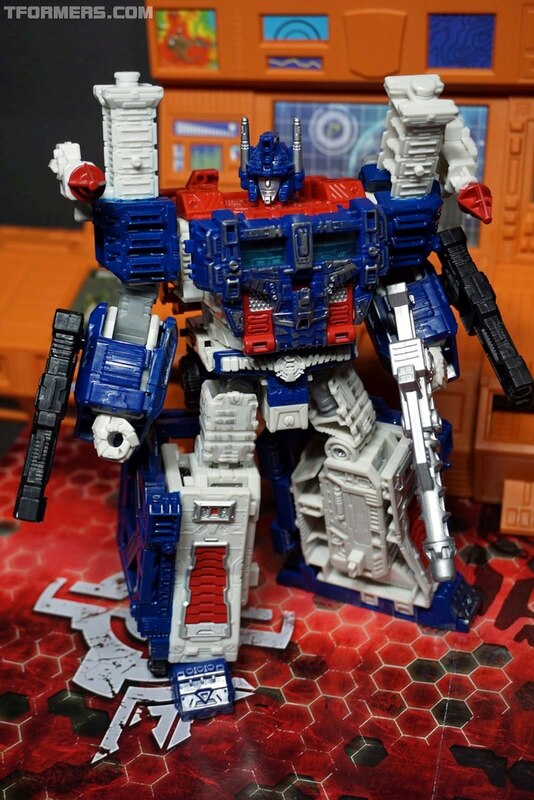 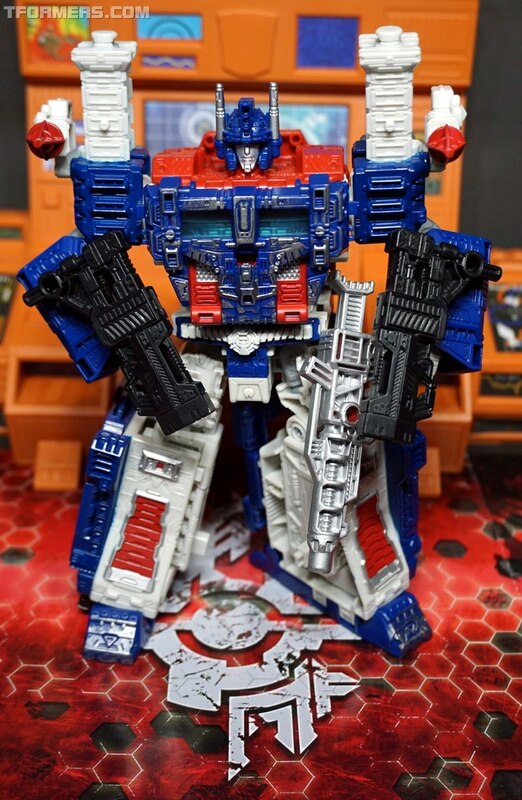 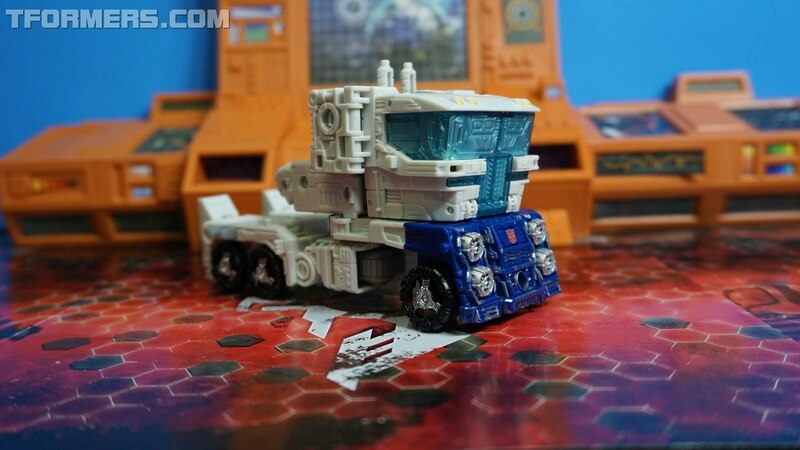 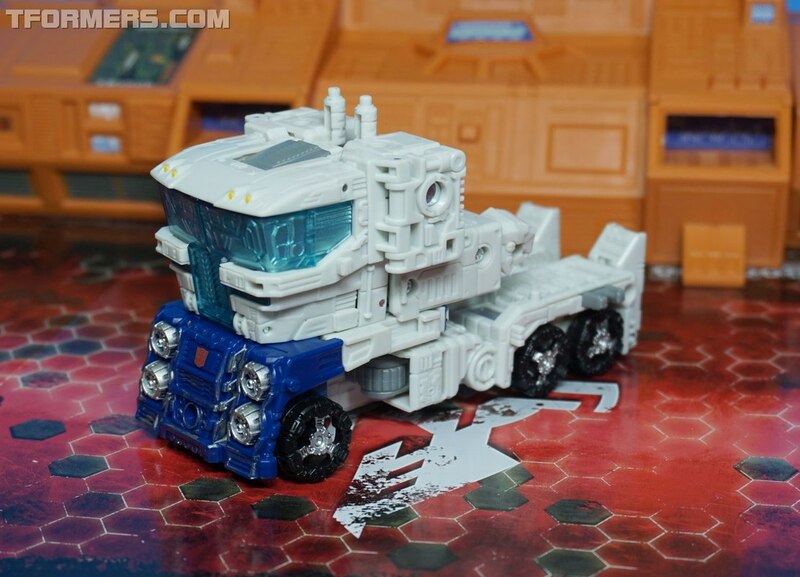 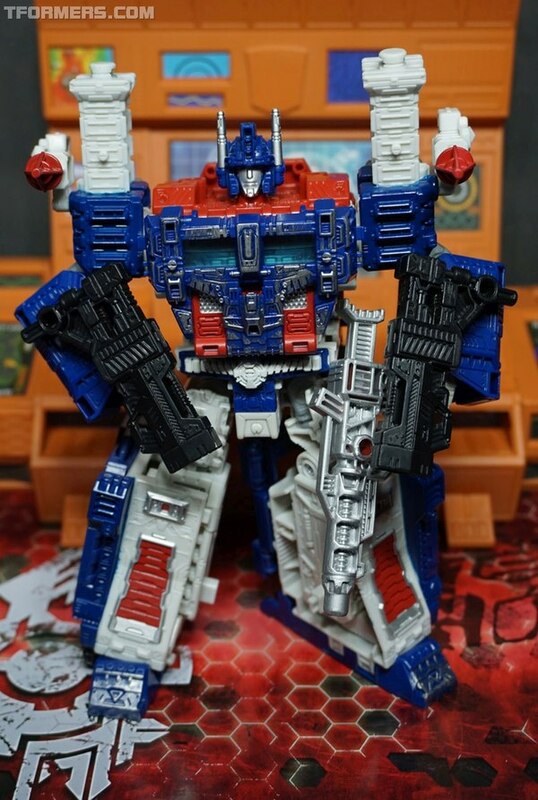 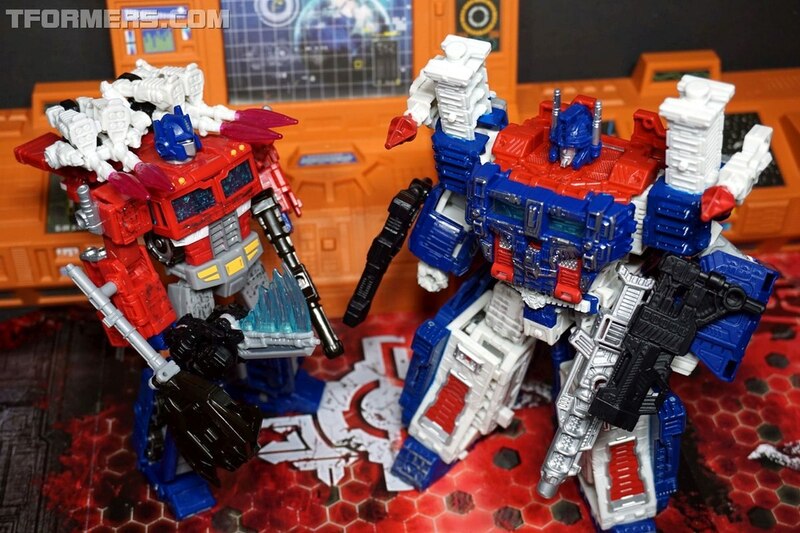 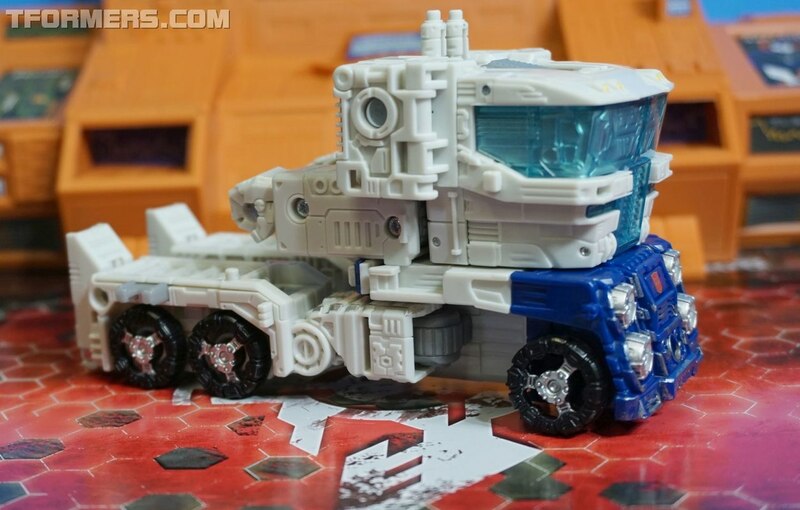 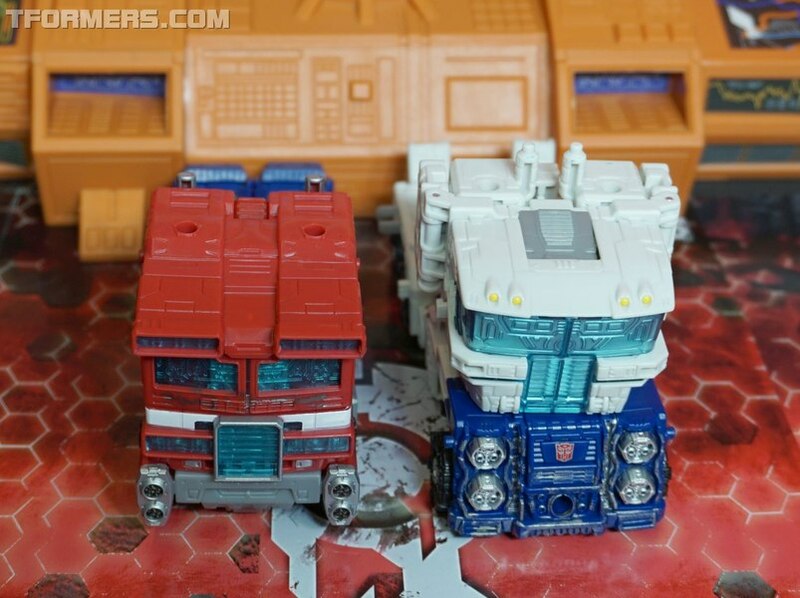 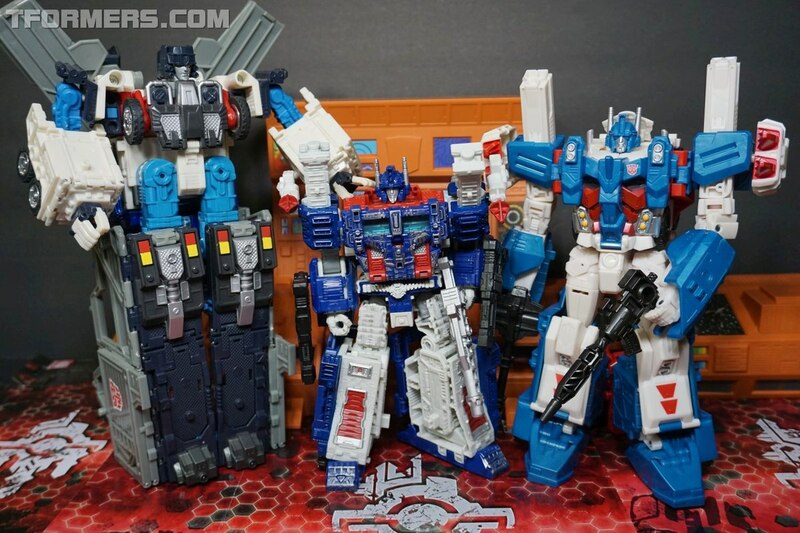 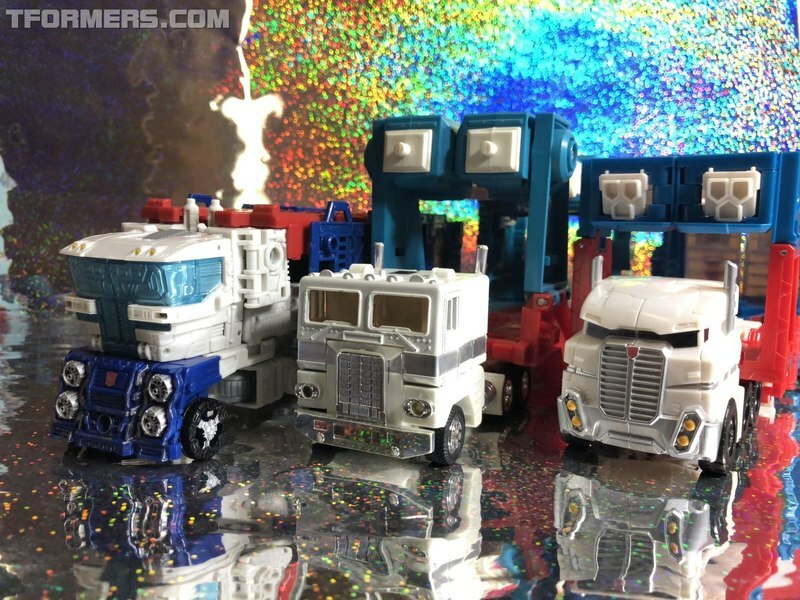 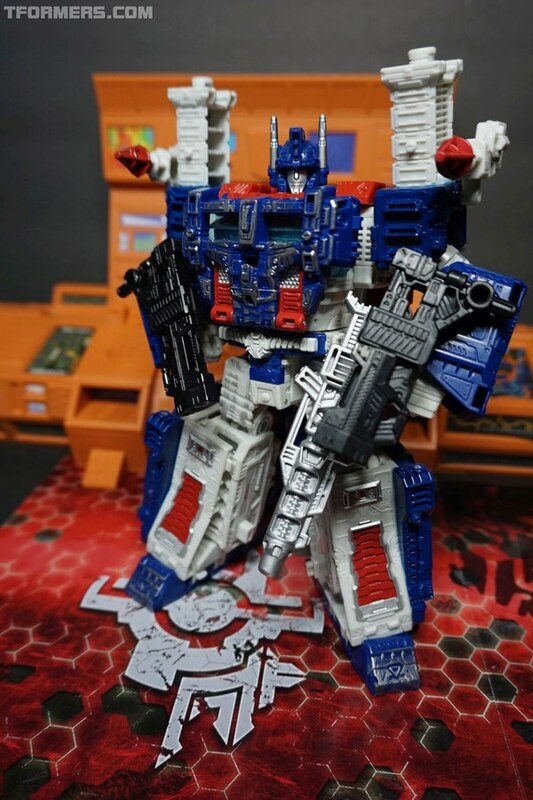 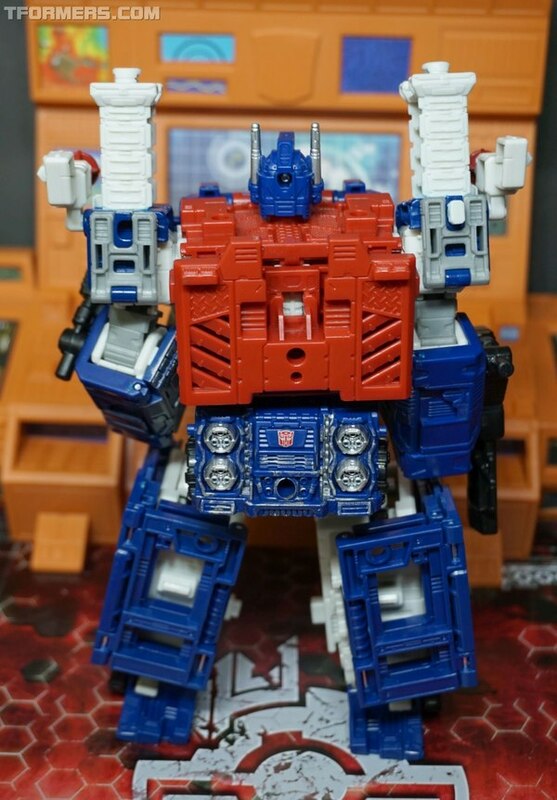 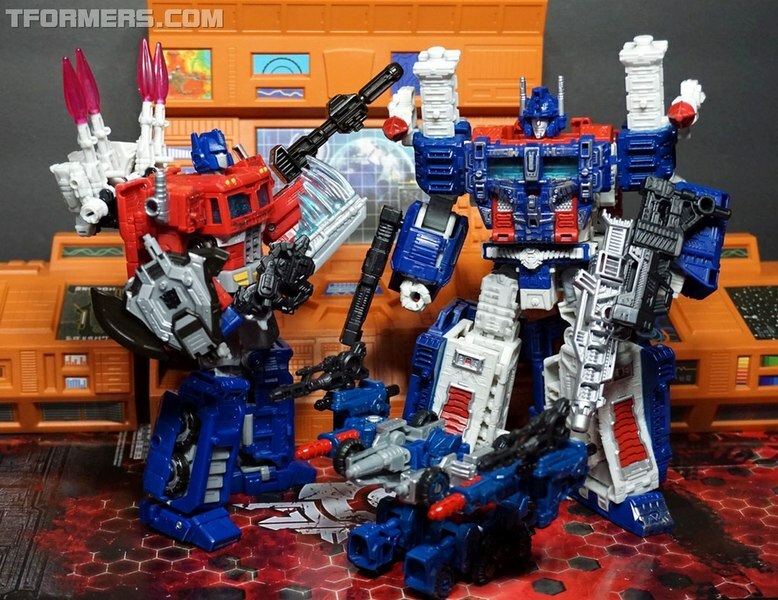 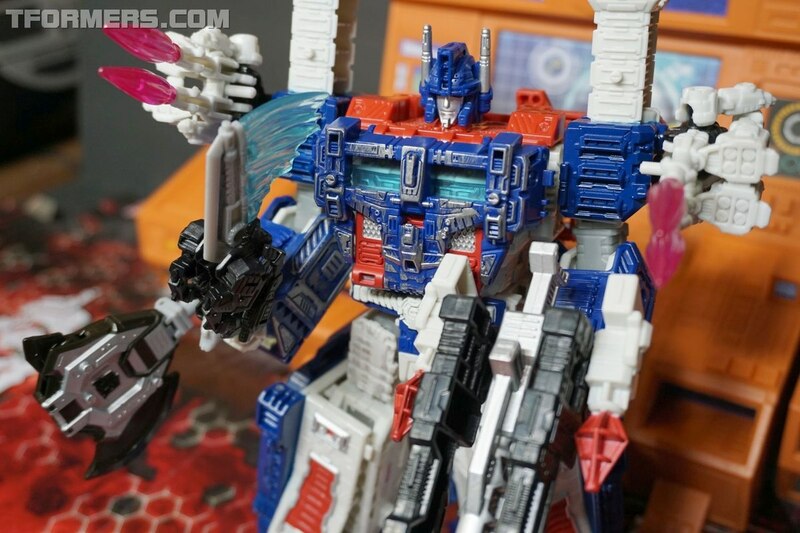 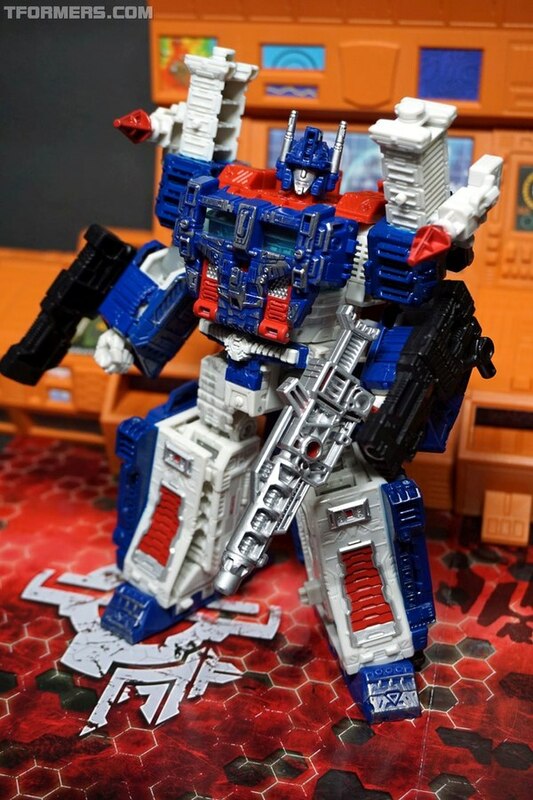 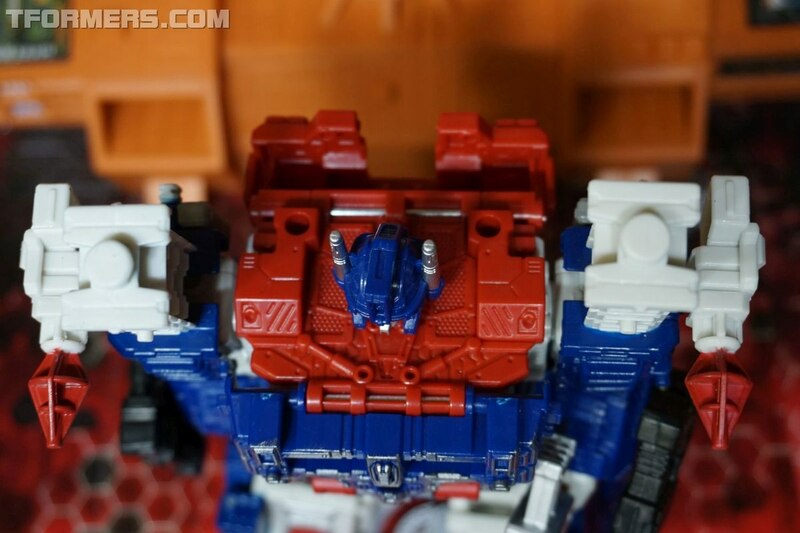 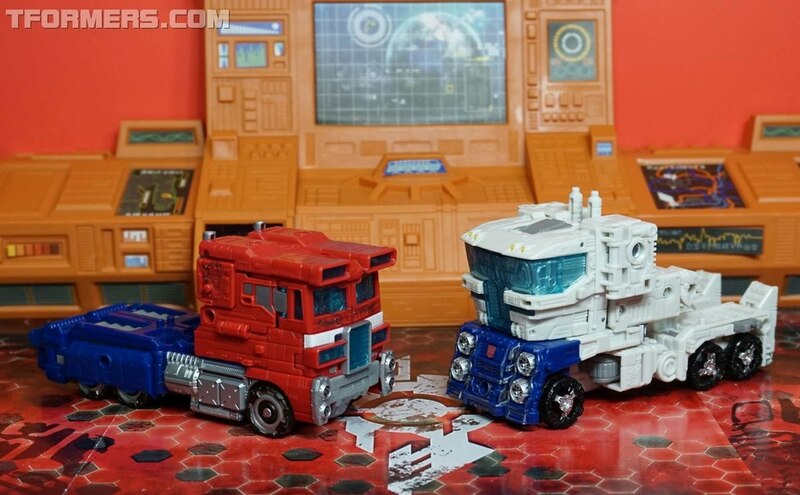 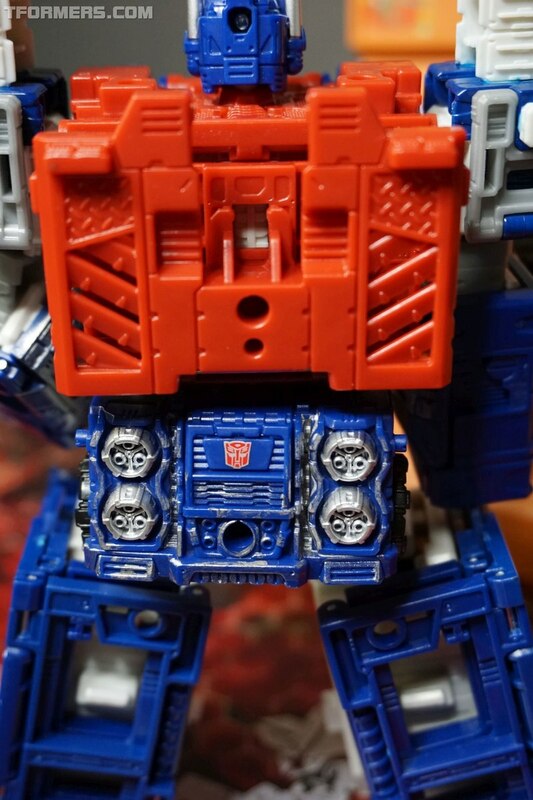 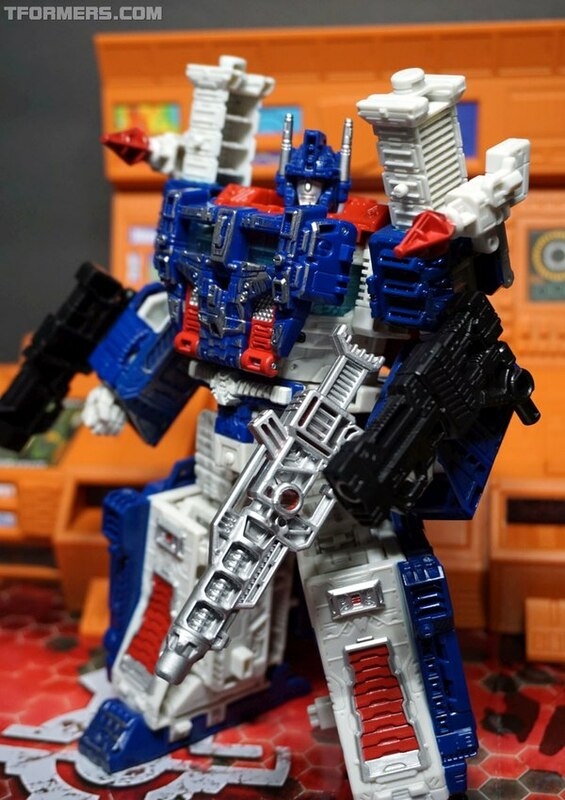 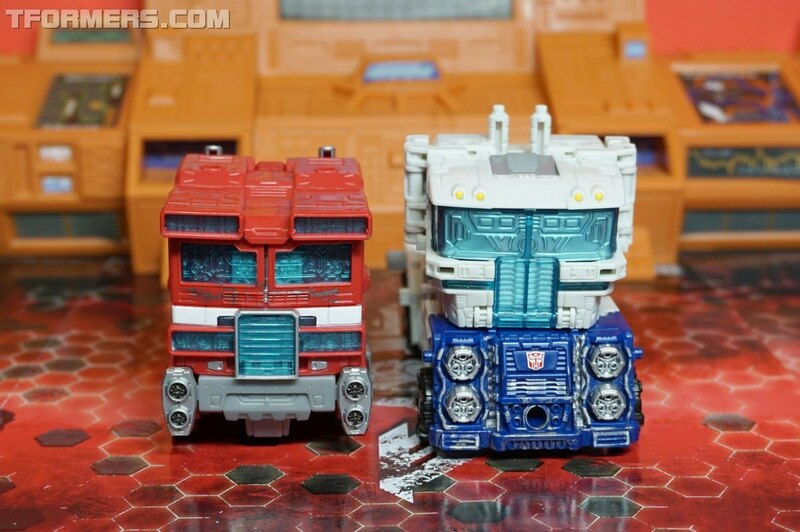 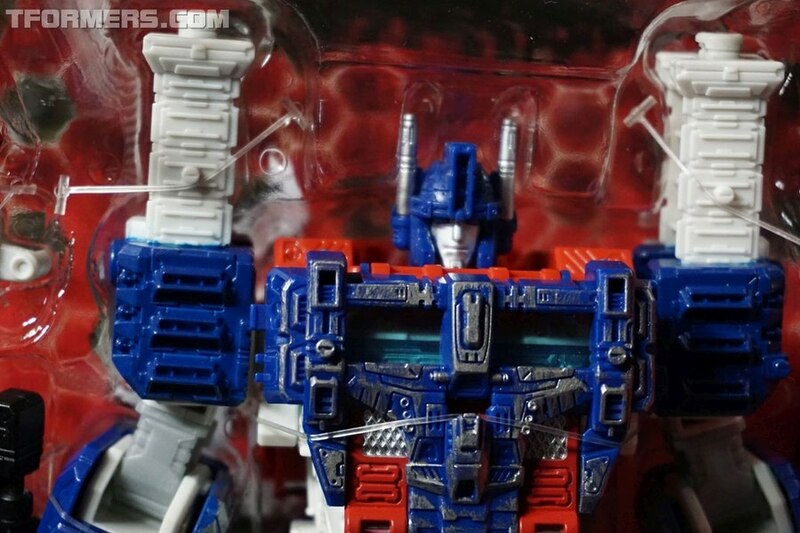 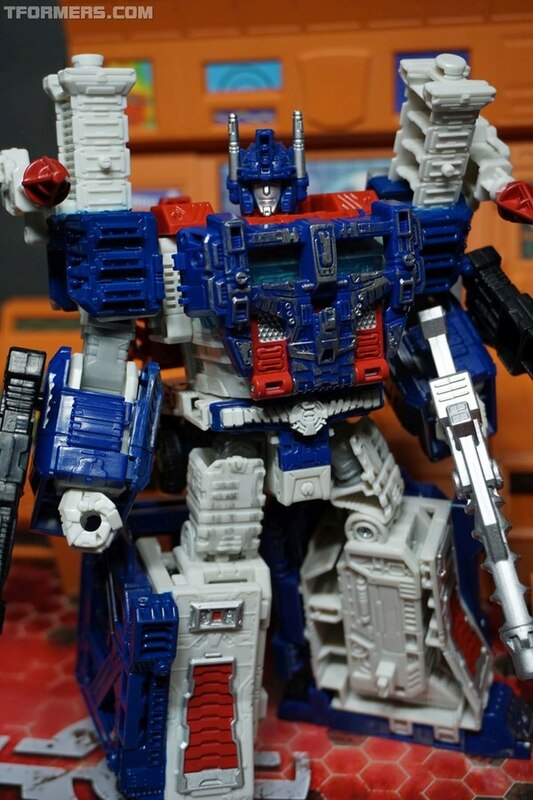 Siege Ultra Magnus looks like his G1 senior, but the toy design is completely different. Transforming to the inner-bot is mostly a matter of taking things off him. 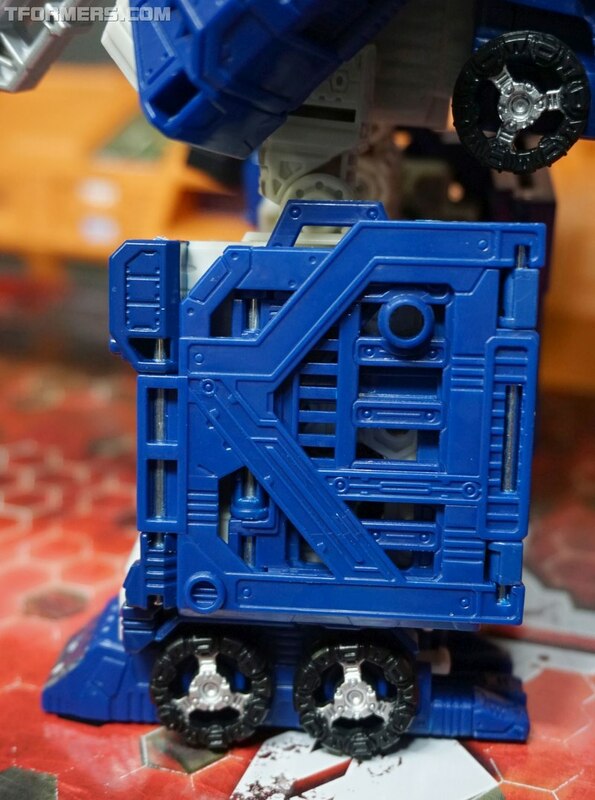 The many upgrade parts come off in an ad-hoc manner leaving you with a generous pile of plastic that is as big as the inner robot itself. 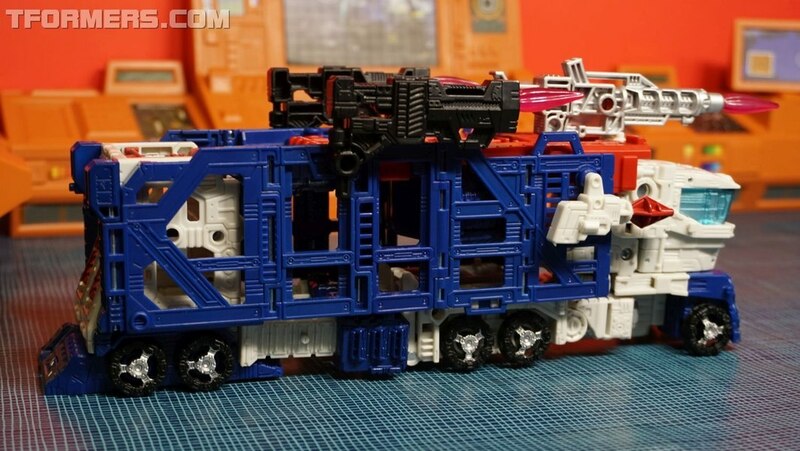 Because it integrates so tightly with the cab, not much is to be done with these parts other than building the trailer. 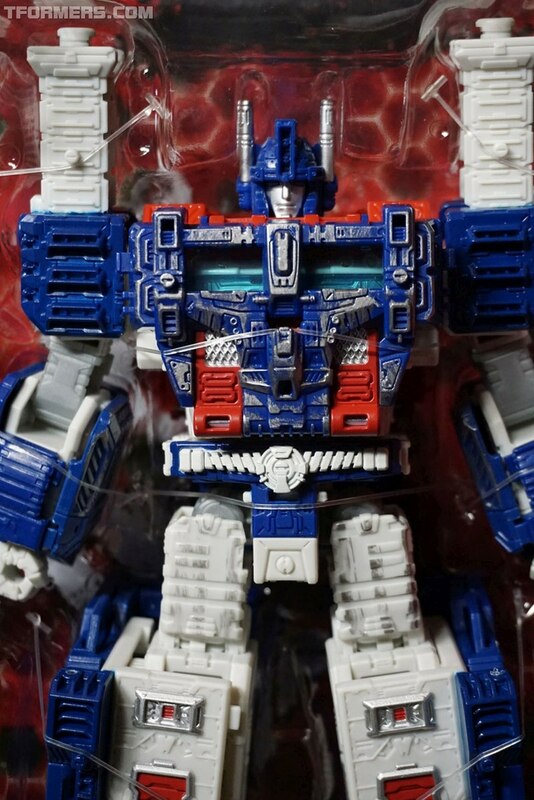 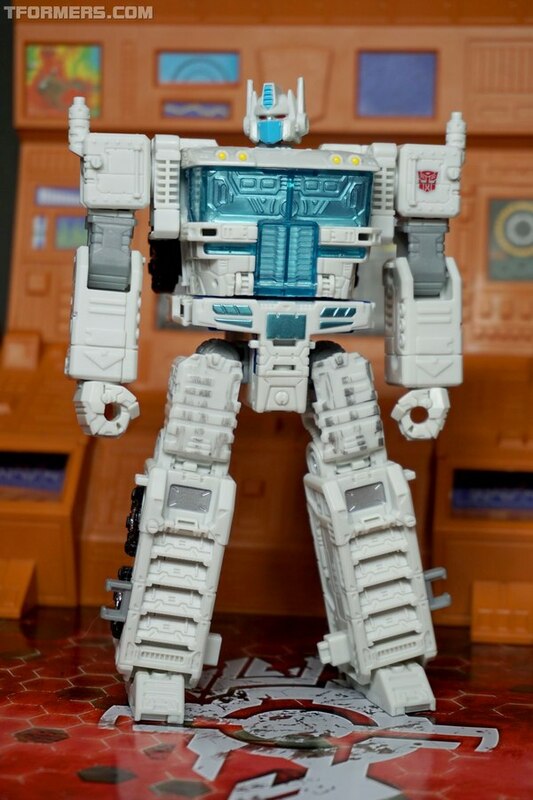 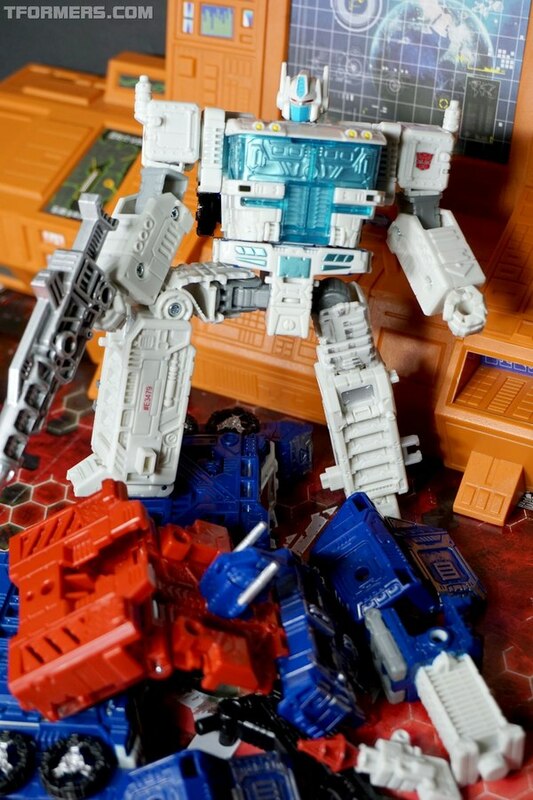 Stripped down to his white inner robot mode, Ultra Magnus is not as much like the Optimus Prime Voyager mold as he first appears. 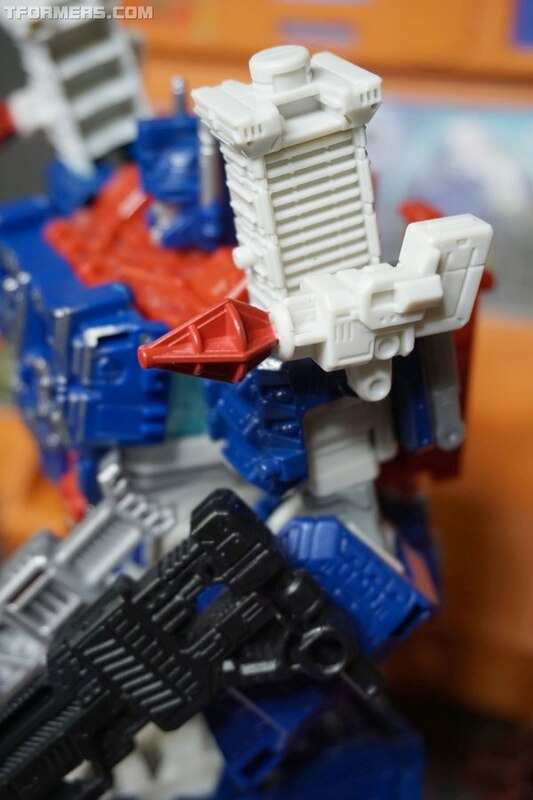 While just about the same height, pretty much all aspects of the figure are different. 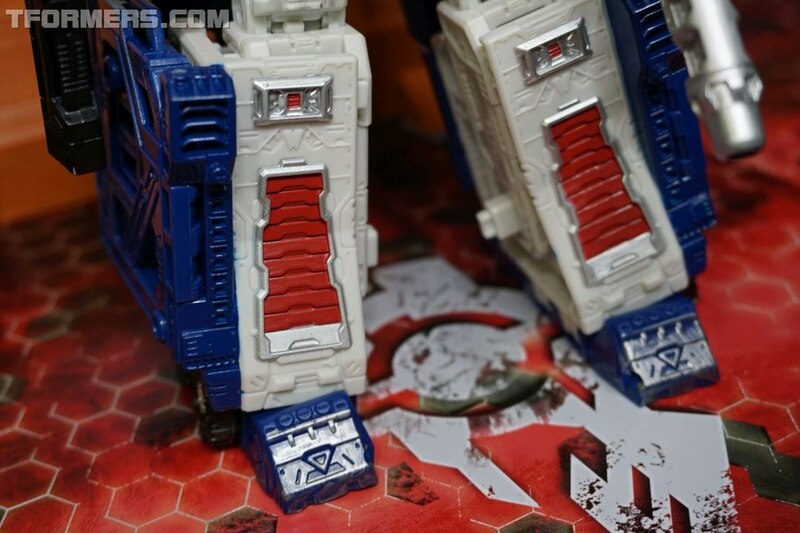 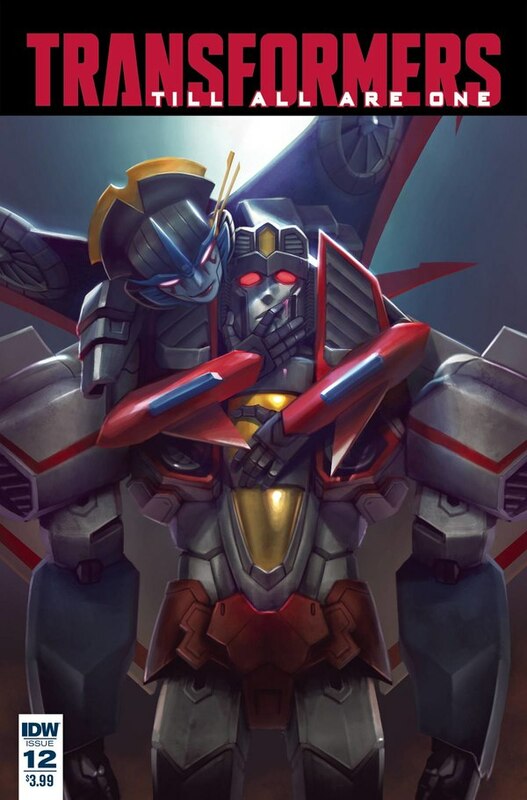 Mostly in the legs which are much heavier and more stunted than the Optimus Voyager. 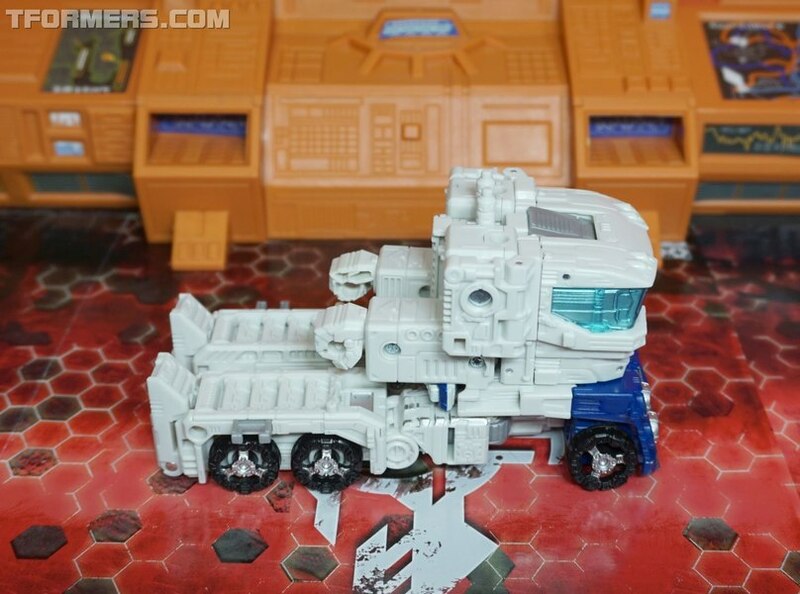 The addition of ratchet joints allow the figure to carry the extra weight of the Powered Mode. What looks off are the small feet that need fold-out extensions so he can stand. 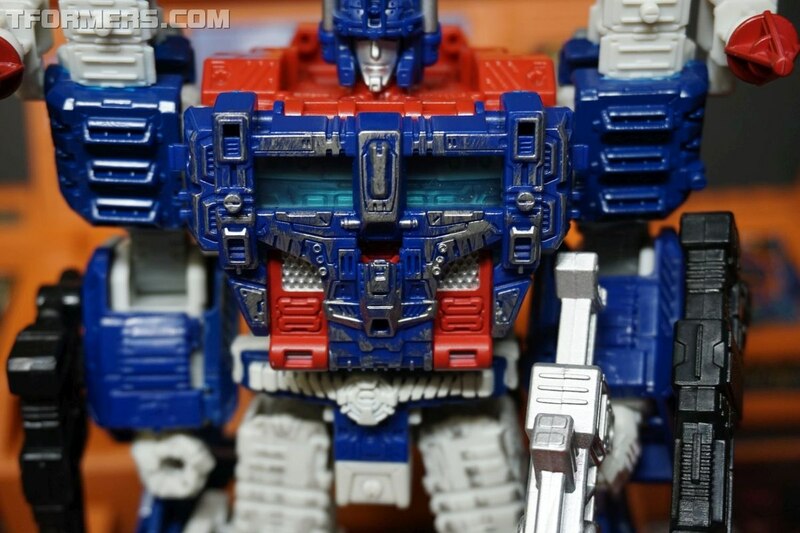 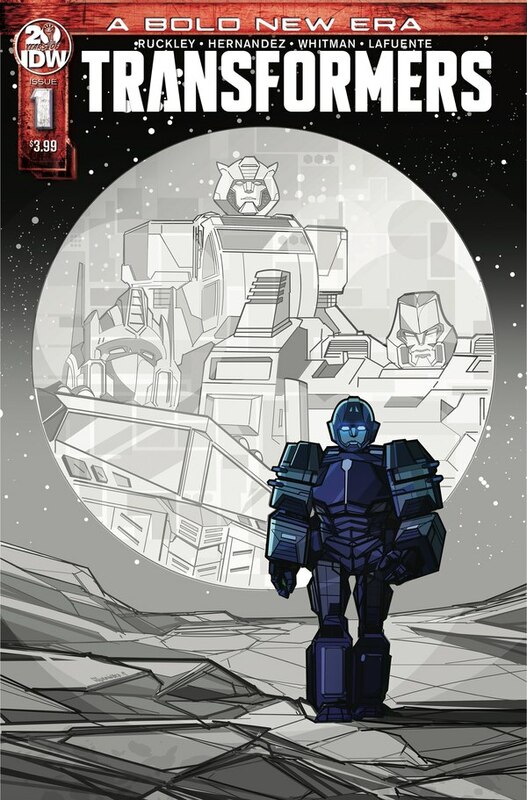 Otherwise, the Cybertronian design is marvelous with the chest in translucent blue over a holographic circuit design. 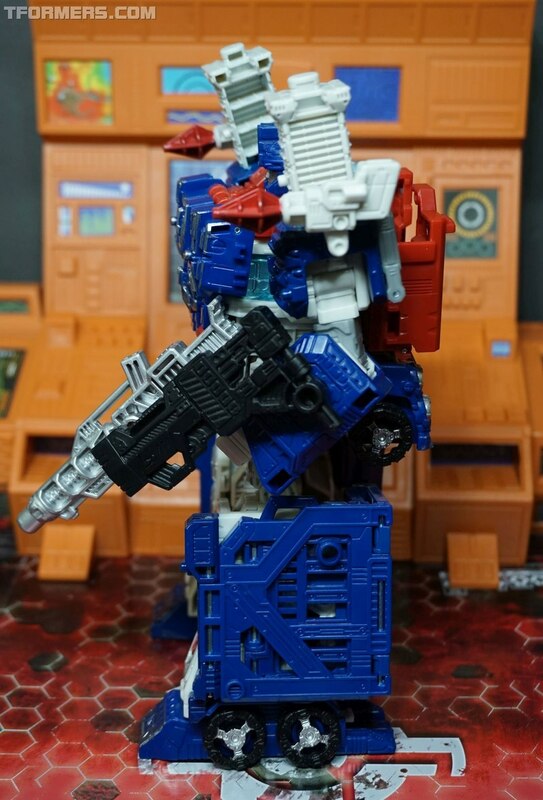 The big silver gun compliments this mode as well, but its the back-pack that really hurts. 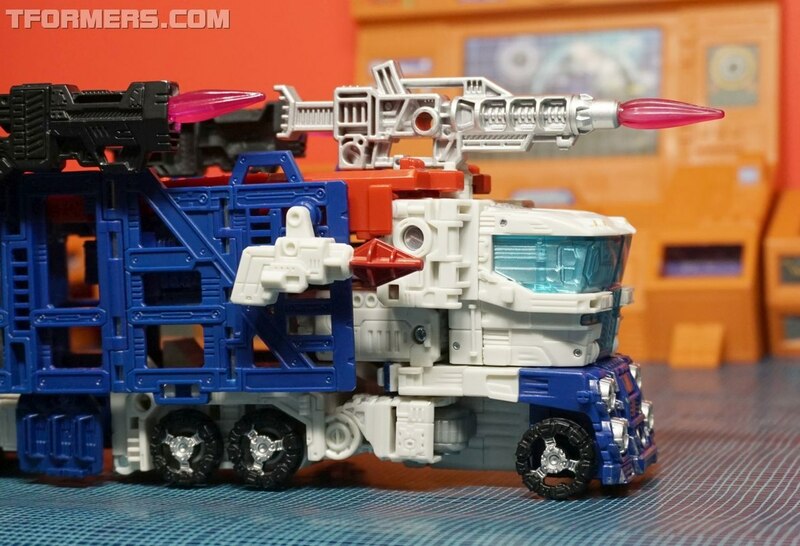 The lower-half of the truck cab is mounted on a really strange sliding rail that moves it down near his waist, mostly out of view, till you spin him around. 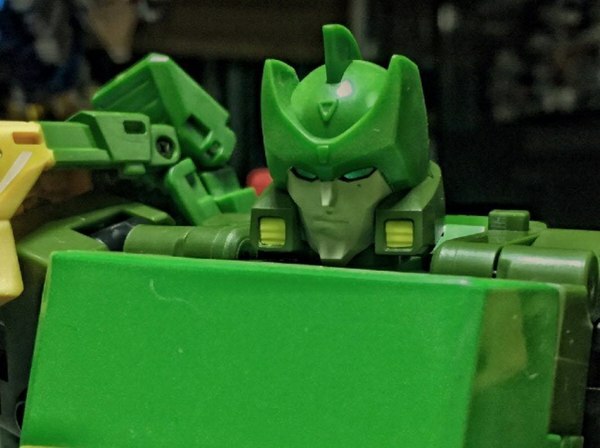 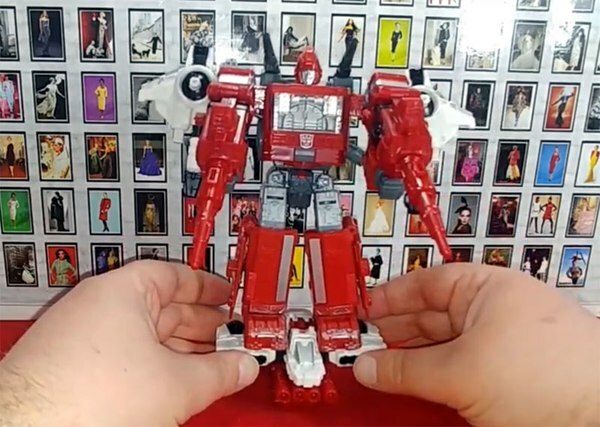 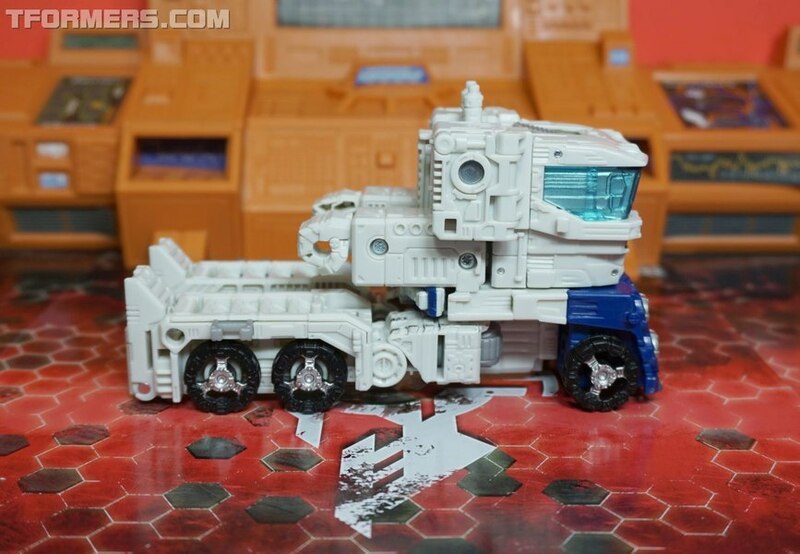 Transformation to his cab mode is a straight forward process of the folding the legs under, moving the arms to the back, splitting the cab to hide the head, and twisting the torso around to align with the lower-half of the cab. 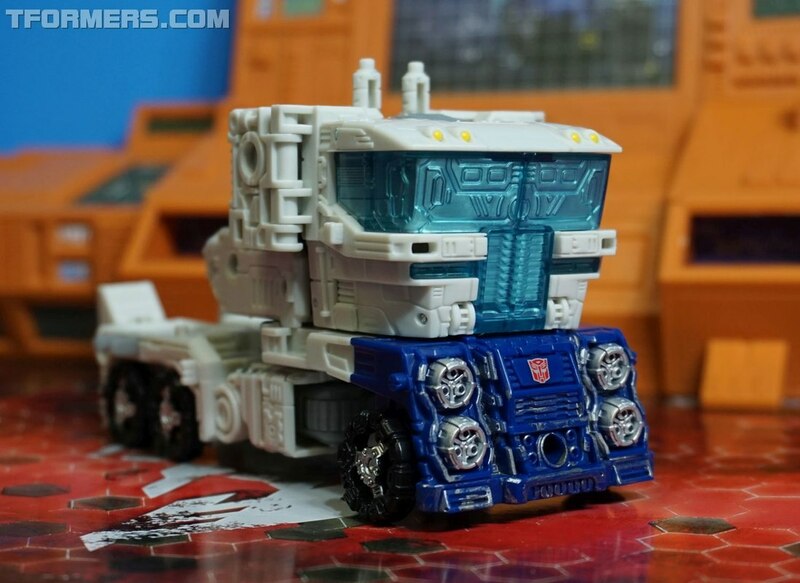 The sharp angles and darker blue bumper really makes the Cybertronian styling on the cab POP. 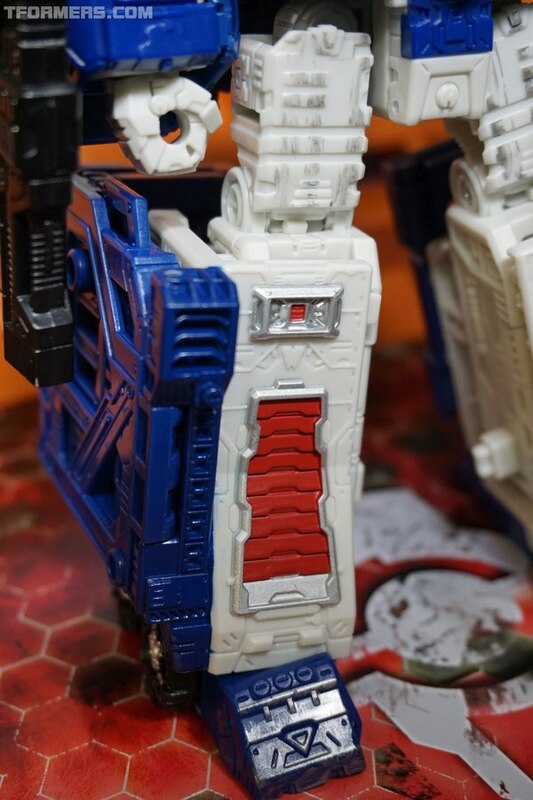 Until, we see the arm kibble hanging off the back. 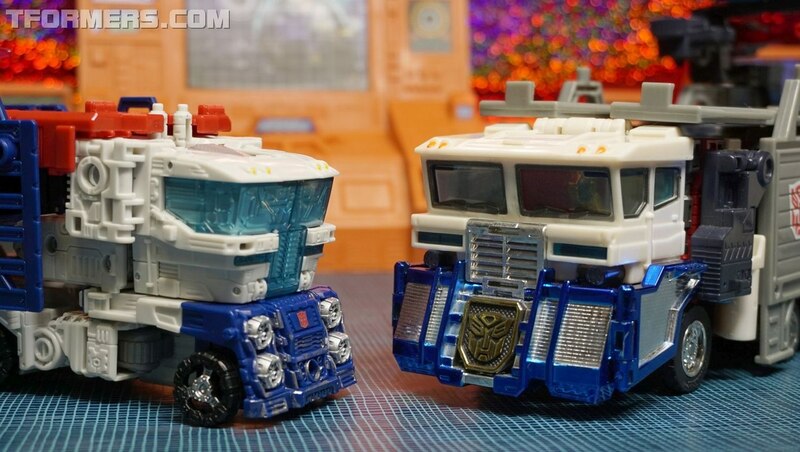 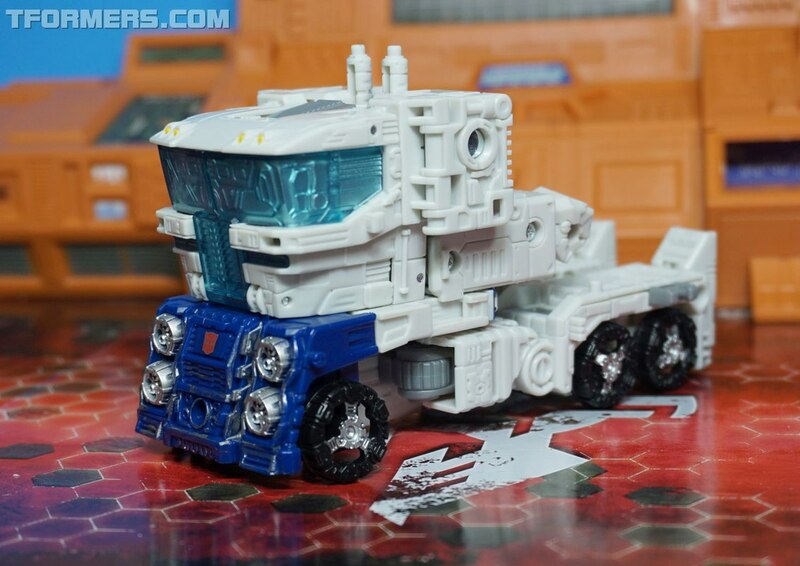 Many have noted this is a scaled down remake of the Robots In Disguise (2001) Ultra Magnus. 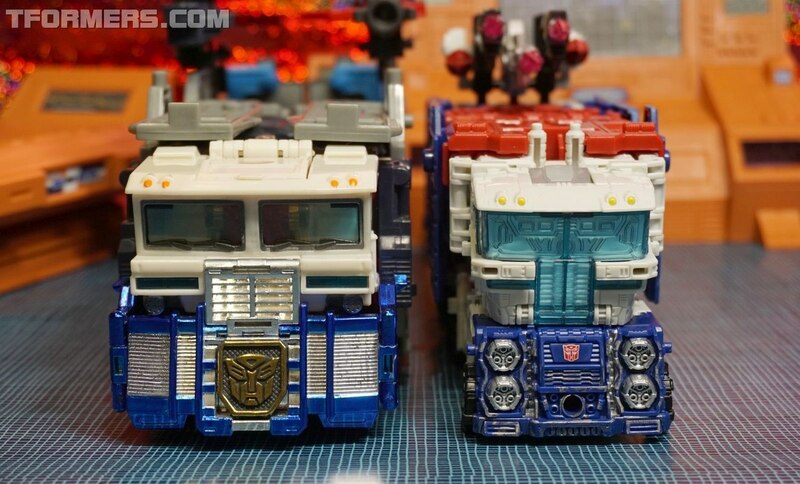 When placed side by side, we seen an all new design in the cab. 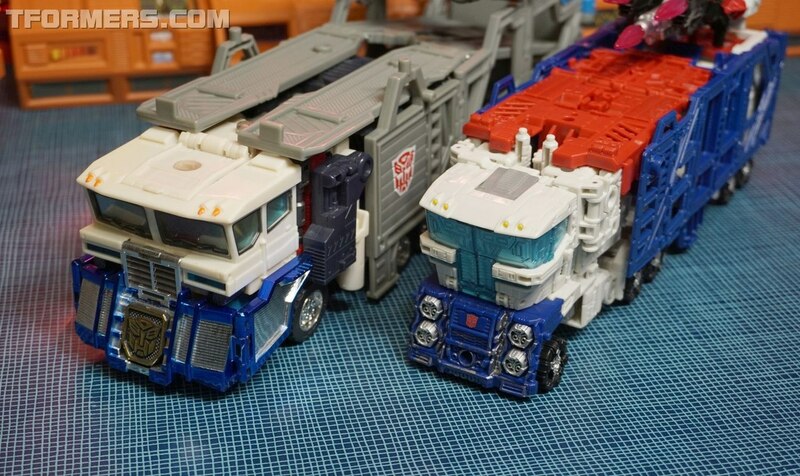 Where they are the most similar is in how the car-carrier trailer comes together. 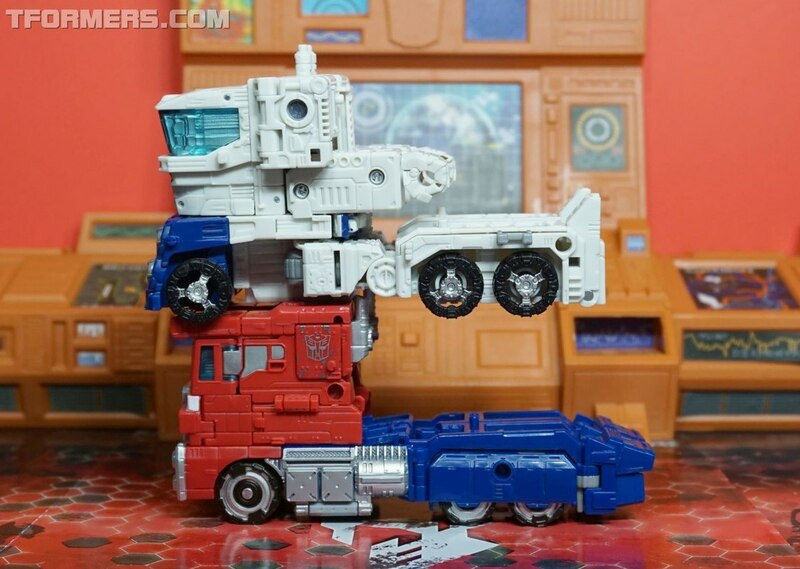 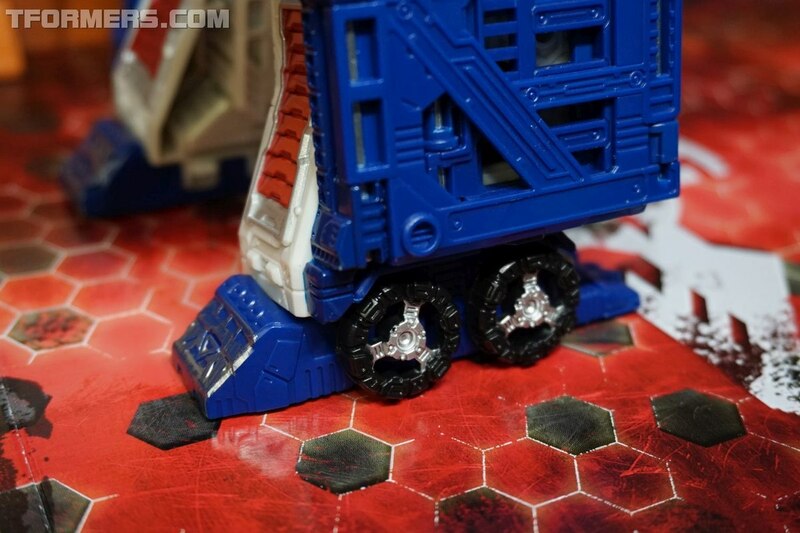 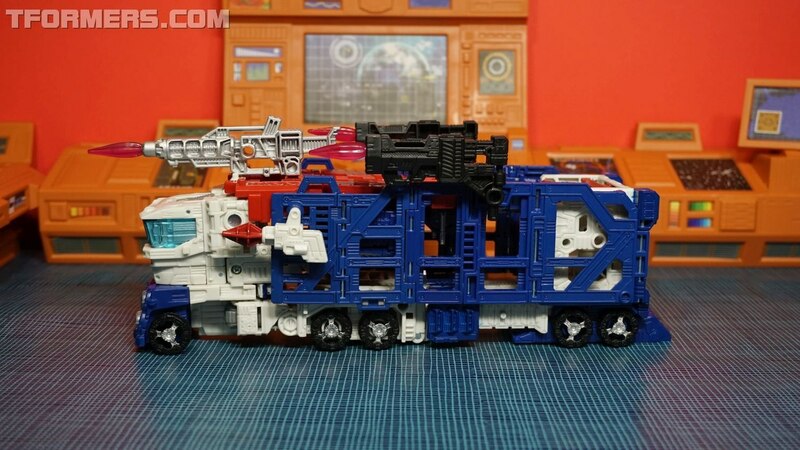 Like the giant legs on Powered mode, Siege Magnus' are also the back and sides that combine to form the trailer. 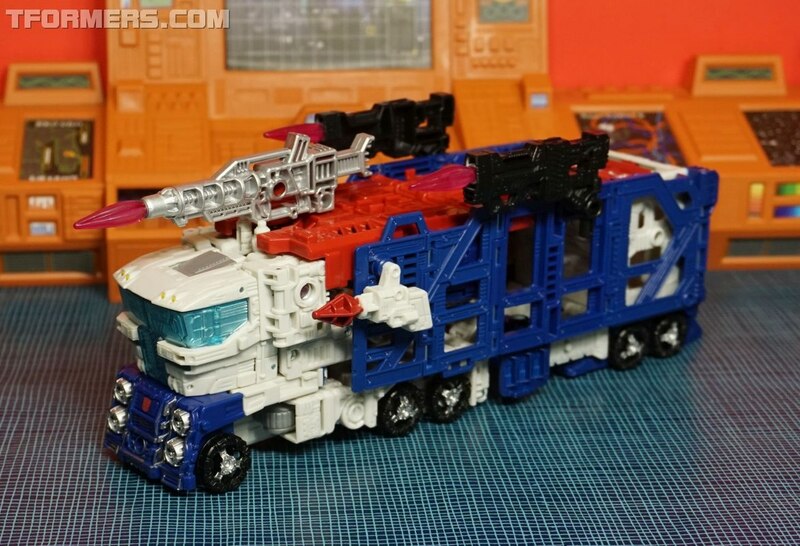 Previously mentioned as a disconnected mess of parts, everything fits together to make a trailer that is surprisingly bigger than I expected, and solid enough to carry the Deluxe and Voyager class Siege toys, among others. 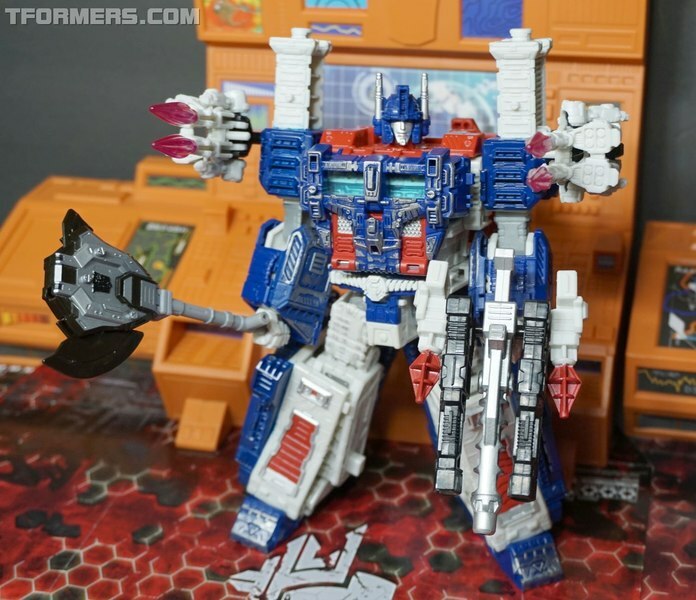 Overall, Siege Ultra Magnus turned out to be a much better toy than I expected. While he is smaller than other Leader Class figures. 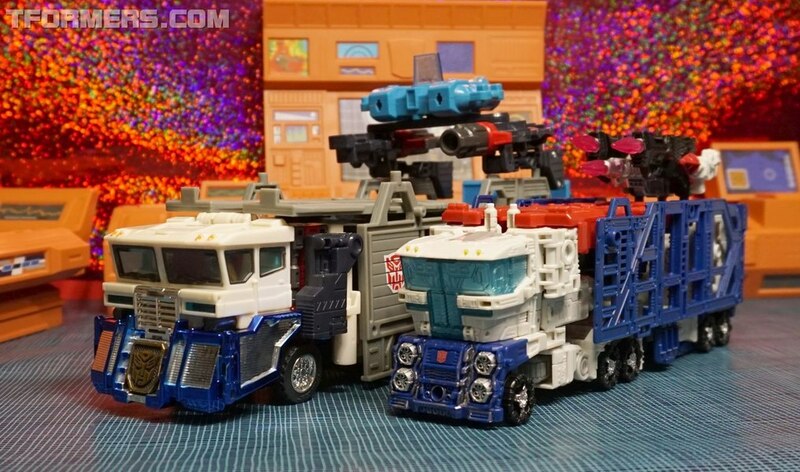 The amount of functionality more than makes up for it with two really good robot modes and two really good alternate modes. 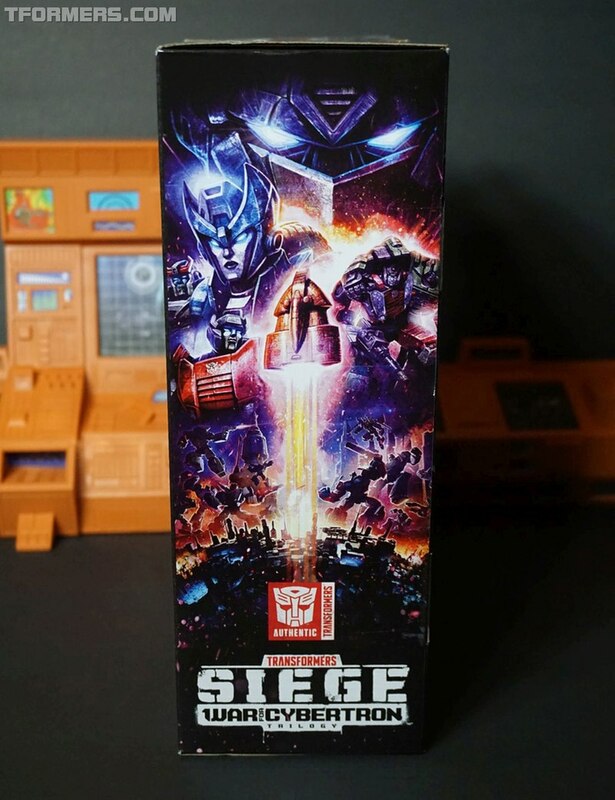 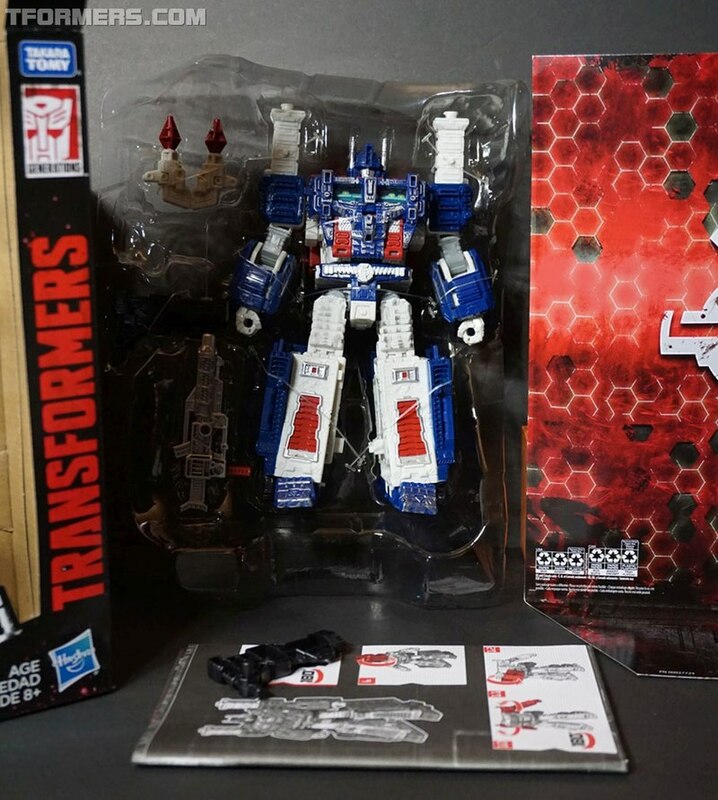 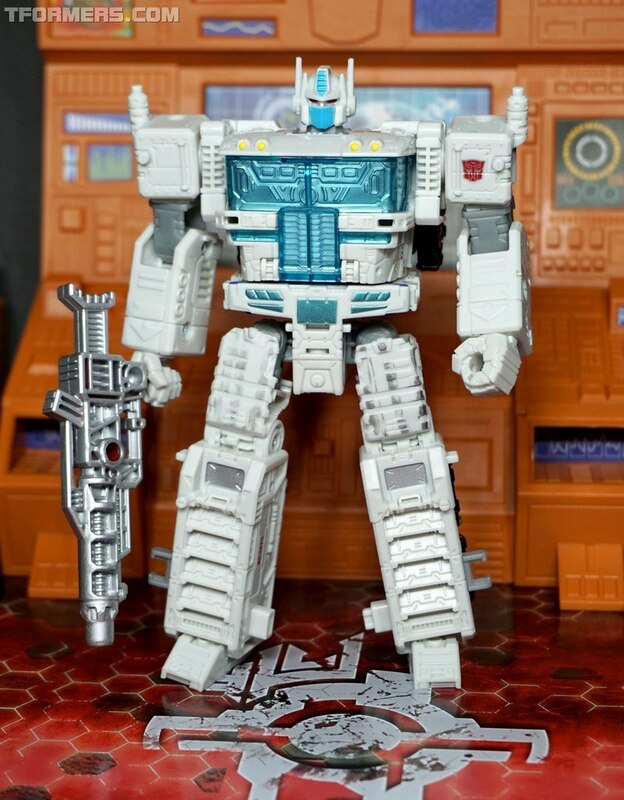 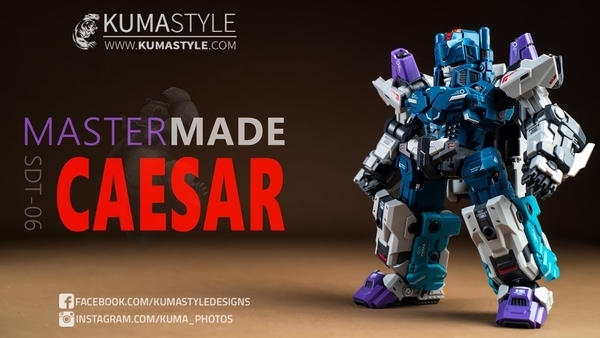 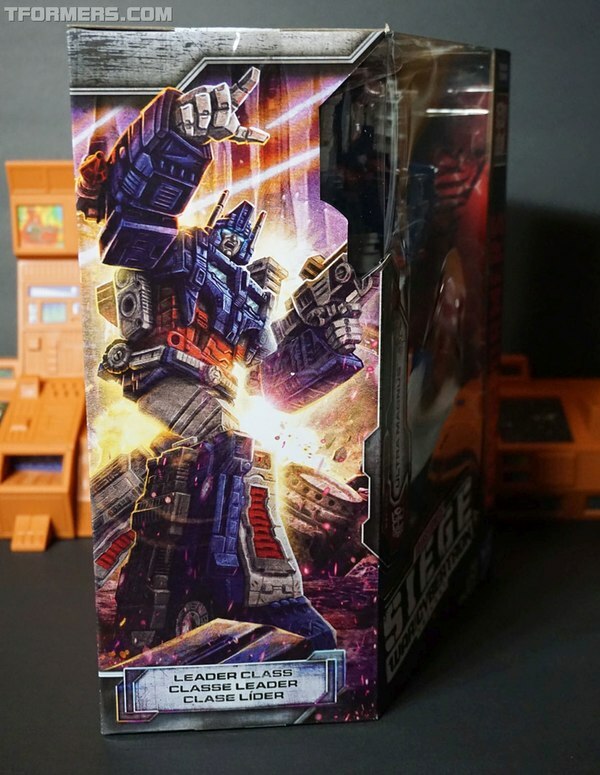 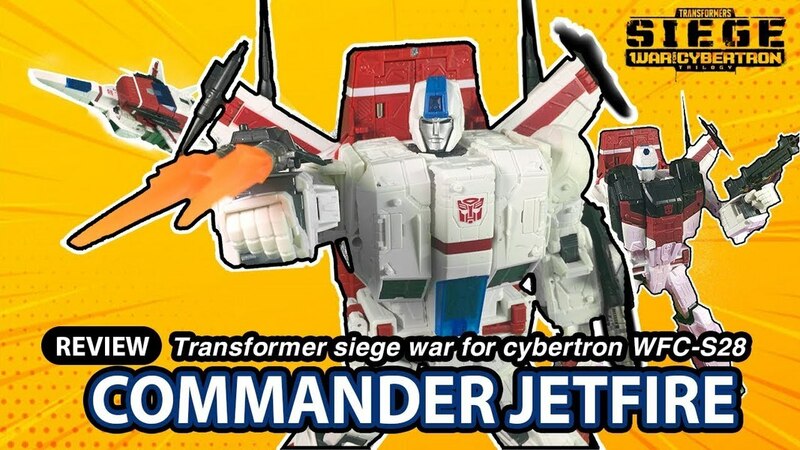 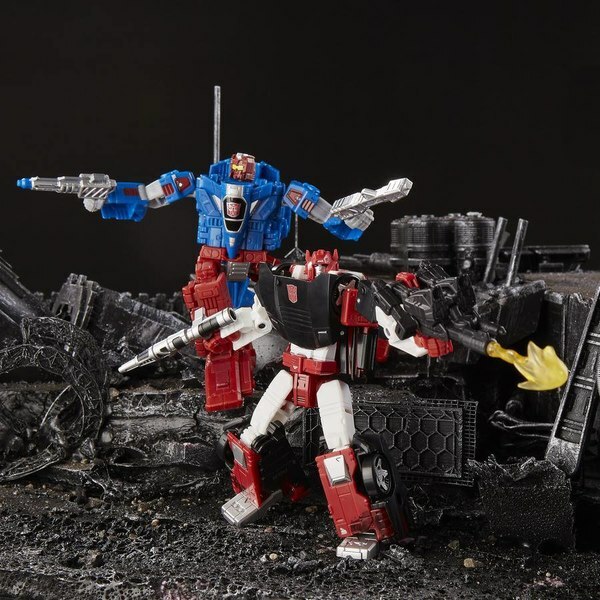 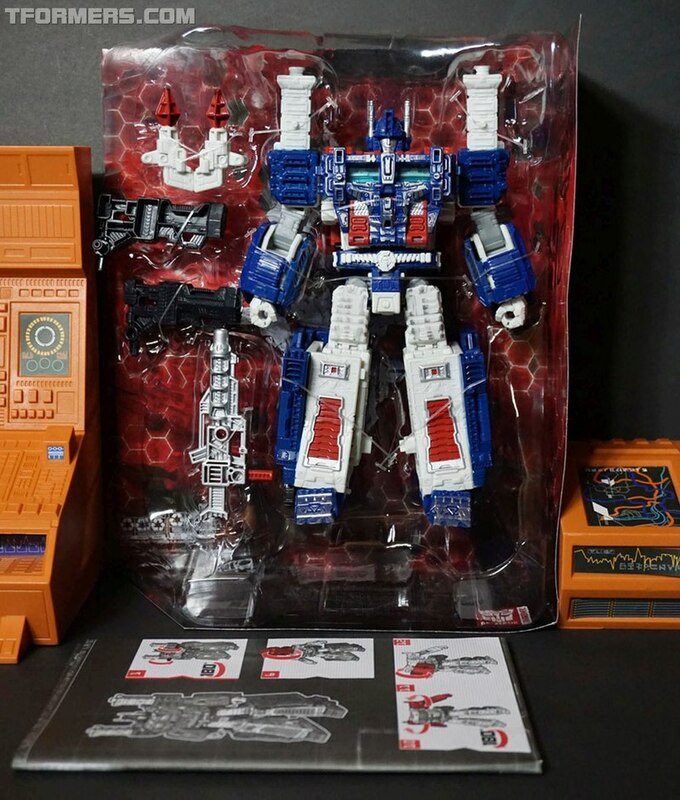 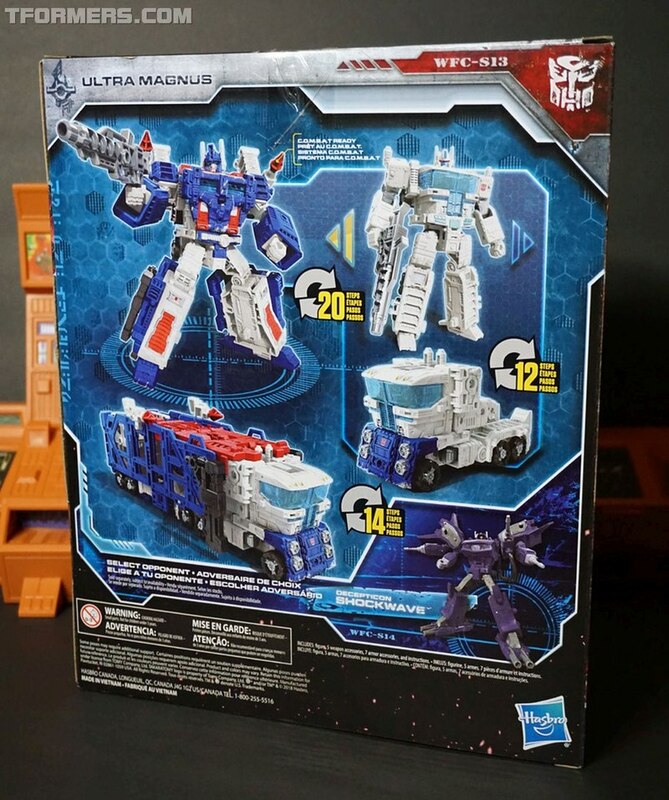 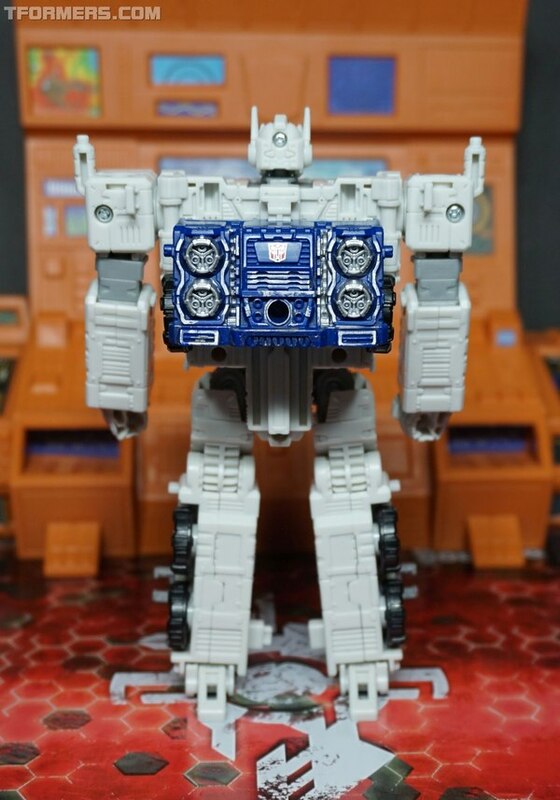 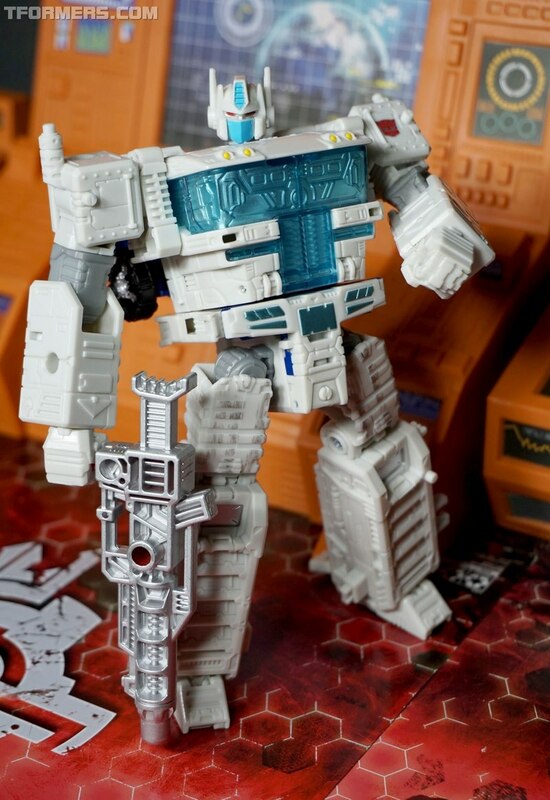 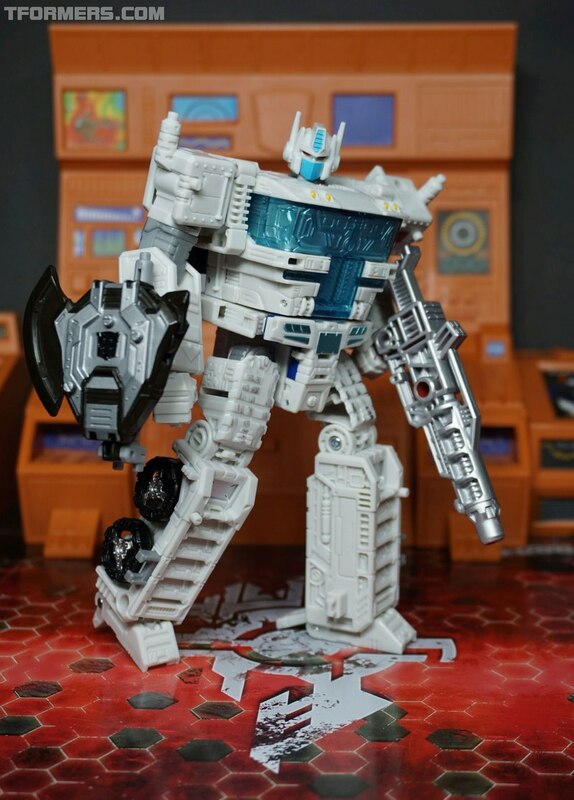 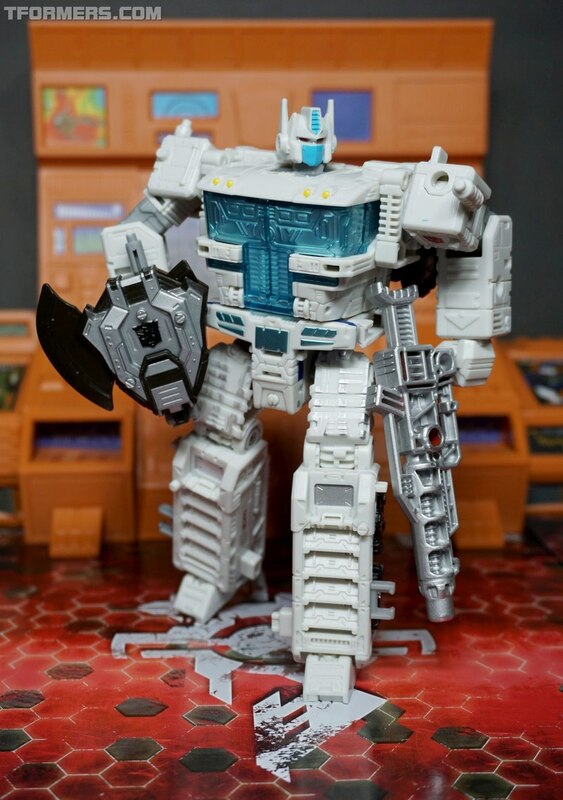 Considering this is on top of the interchangeability with all the other Siege figures, the designers have delivered an Ultra Magnus that captures the past with a really well made toy that has all the extras fans expect from a Leader class toy. 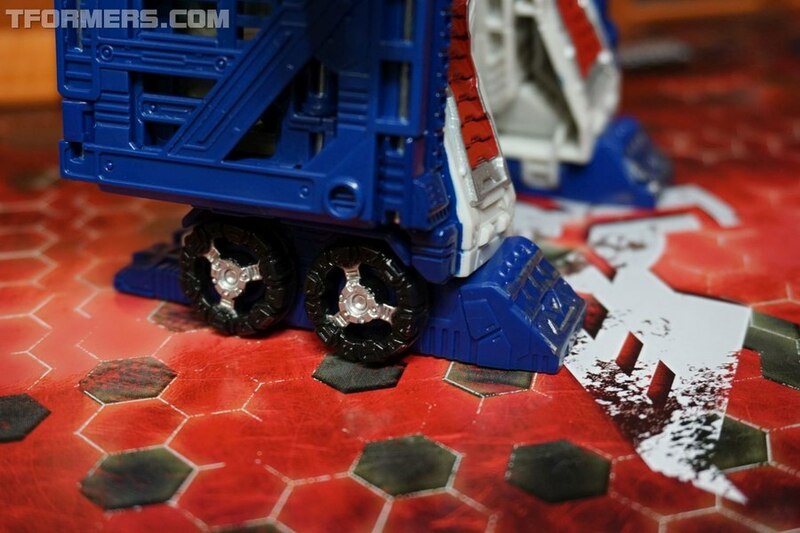 Check out many more images in the gallery below.